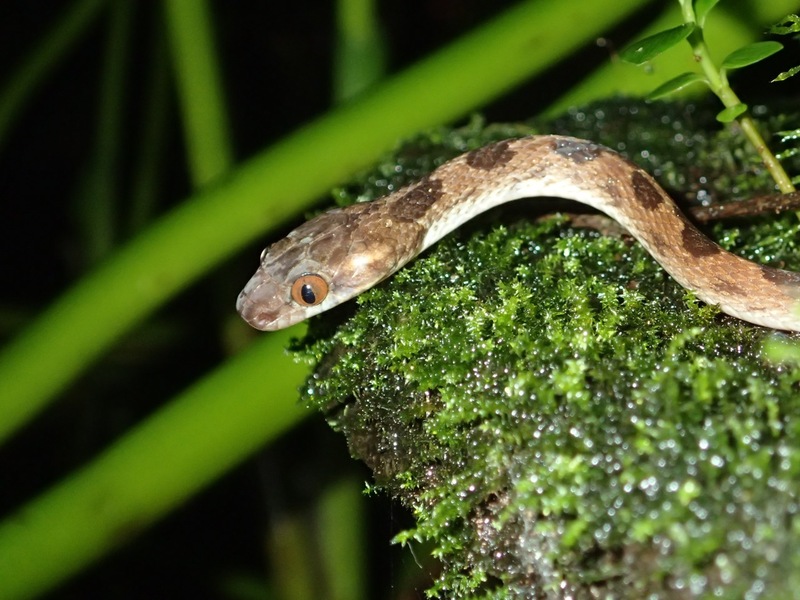 bassariscus.me | Ringtails, Bats, and Belize…Oh My! 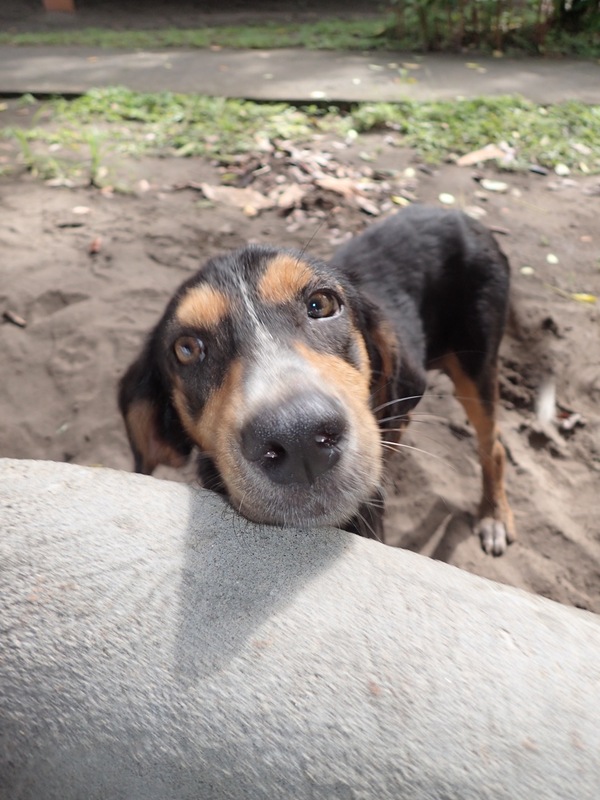 Hi to everyone interested in seeing what we are up to in Costa Rica. 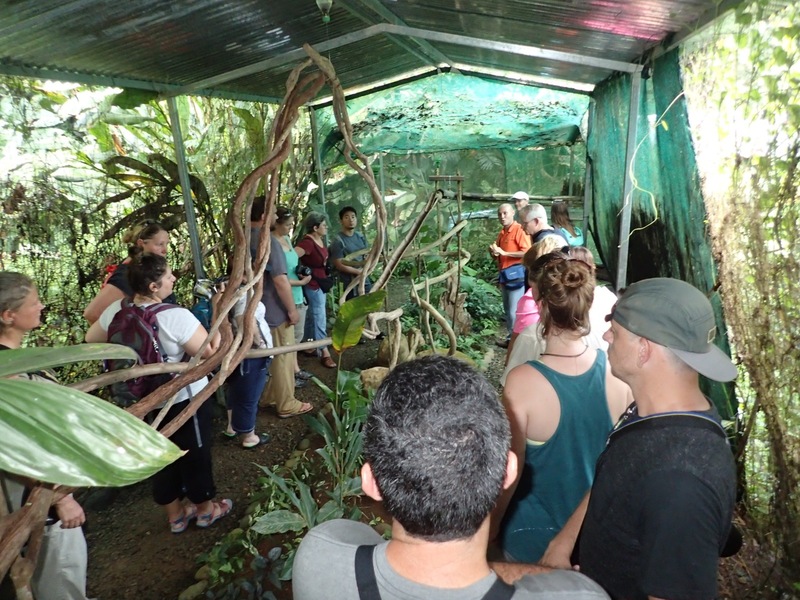 A total of 21 of us are exploring various locations in Costa Rica (Nate, Linda, Stuart, Rebekah, Devi, George, Carolina, Ryan, Brian, Allie, Alec, Laura, Janice, Chris, Kathryn, Kim, Nicole, Stan, Kelly, Michael (our co-leader), and Me – Dave). 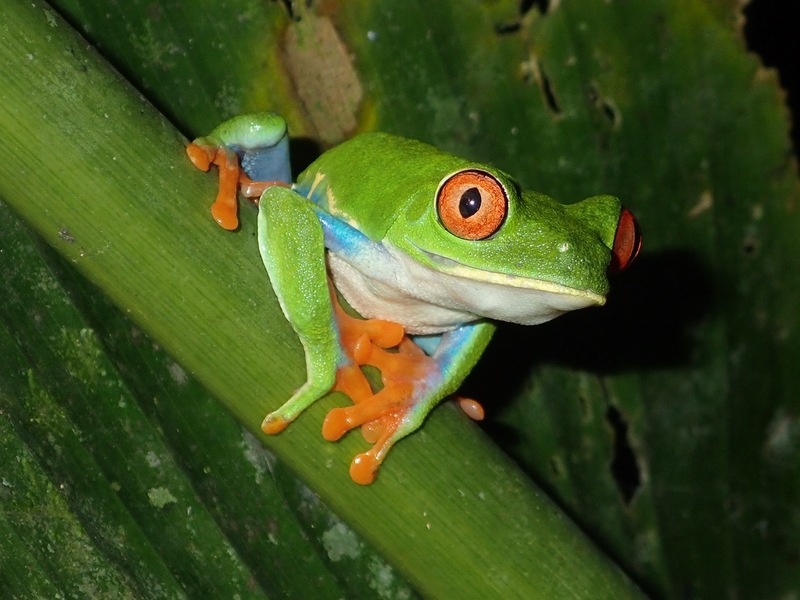 Carlos – owner and operator of Costa Rica Rainforest Experience – is our guy in Costa Rica who made all of the arrangements here and is our fantastic guide as we explore. 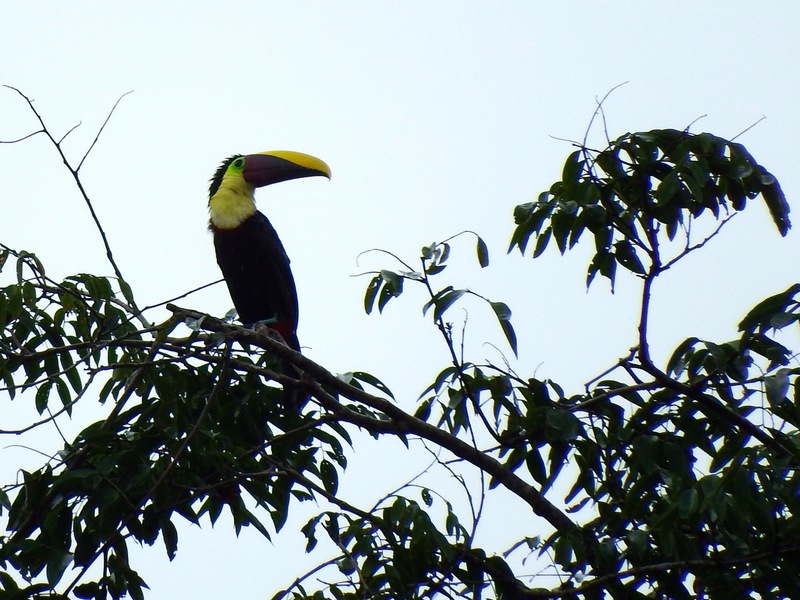 After a grueling day of travel, we arrived in San Jose, Costa Rica on Wednesday July 22. By mid-afternoon/late-afternoon we were ensconced in really comfortable rooms at the Hotel Bougainvillea. The place is beautiful with wonderful staff, and the building and grounds are stunning! 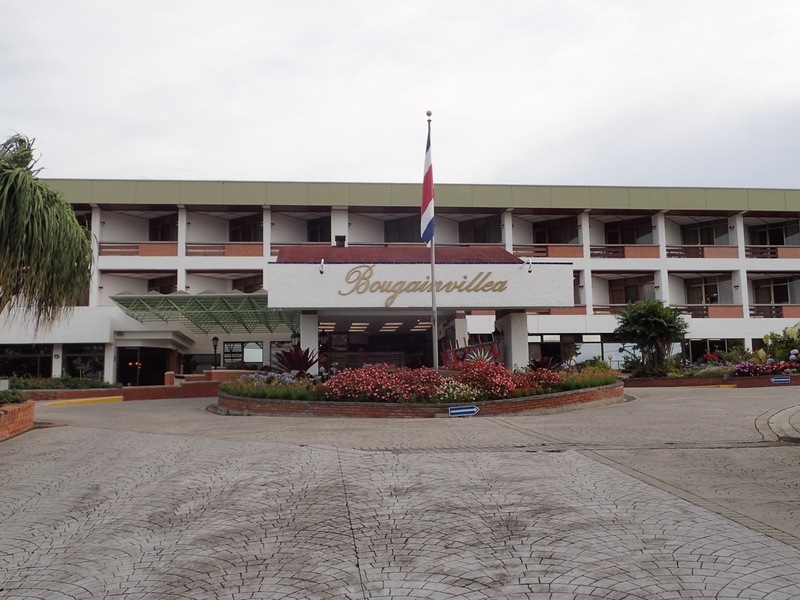 The front entrance of the Hotel Bougainvillea in Santo Domingo, Costa Rica. 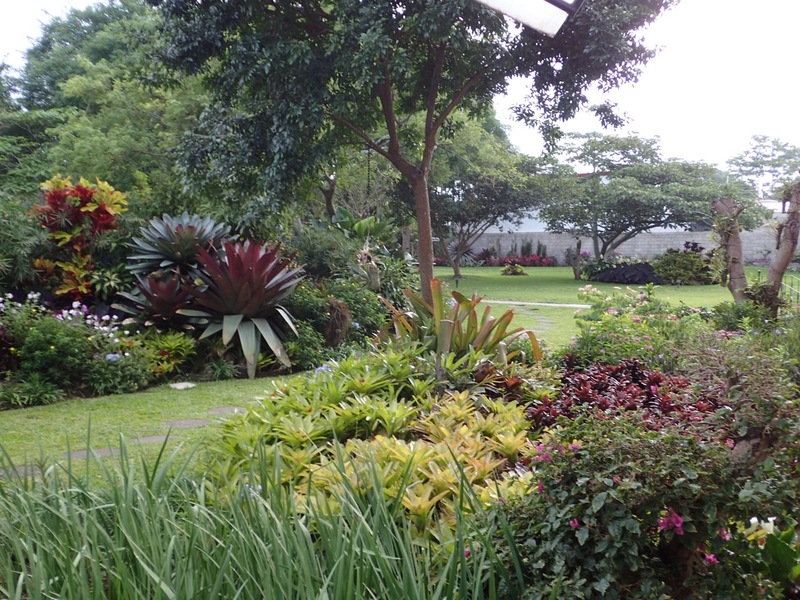 The gardens at the Hotel Bougainvillea. 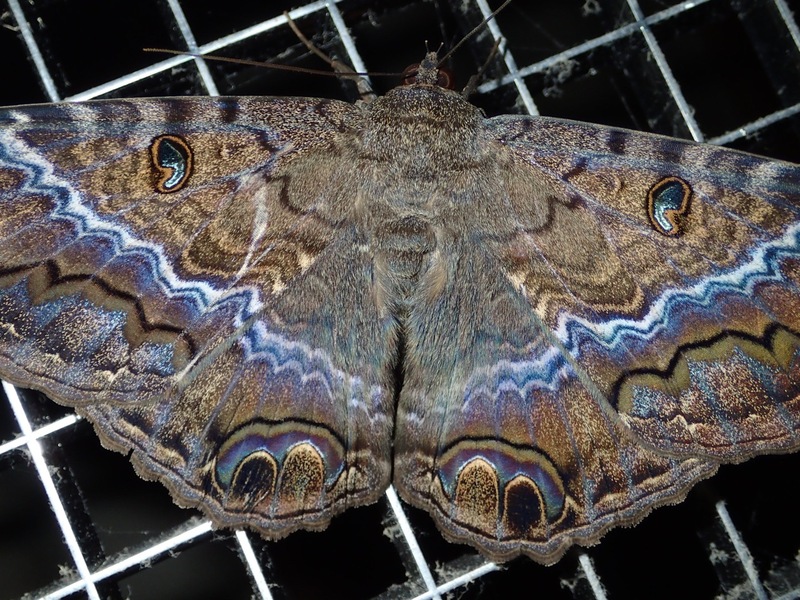 Black Witch moth at the Hotel Bougainvillea. The intrepid hunters of anything that is of interest…Nate, Chris, Brian, and Stan – missing in the photo are Dave and Michael. 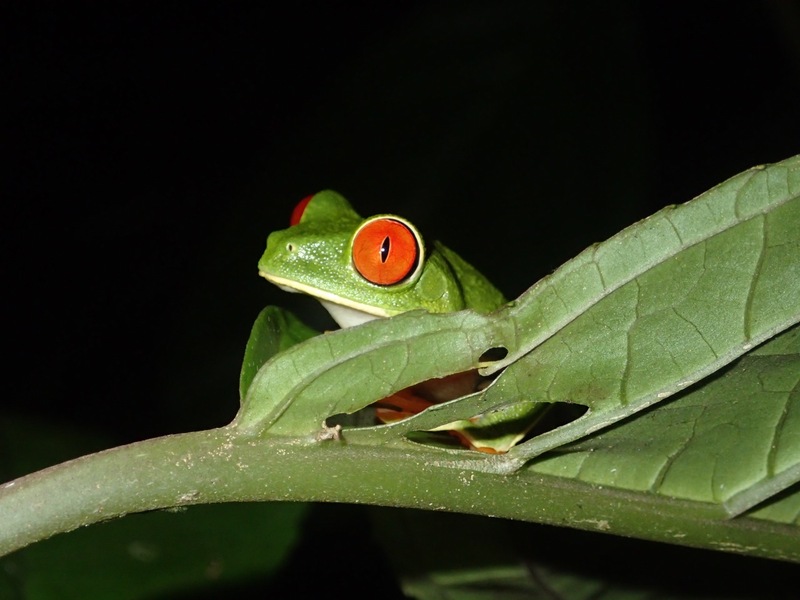 Golden-eyed Tree Frog (Agalchnis annae) near one of the ponds at the Hotel Bougainvillea, Costa Rica. 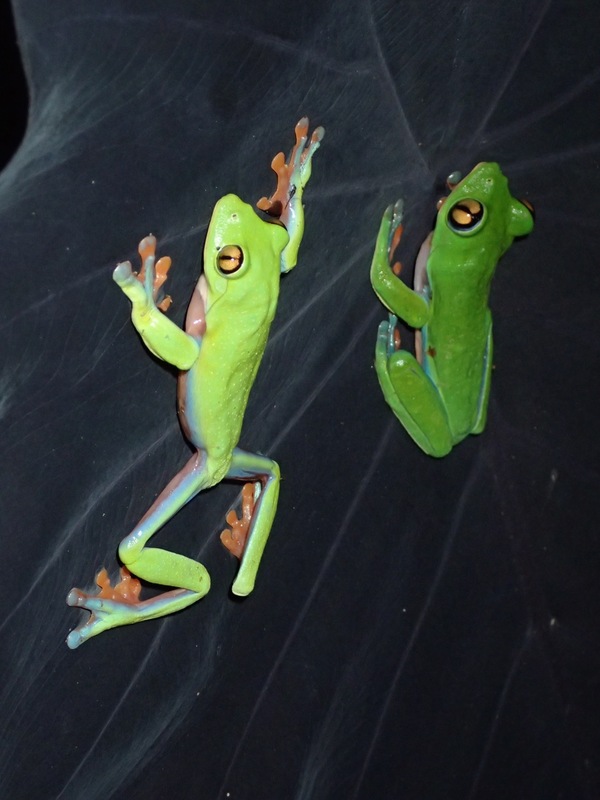 Two Golden-eyed Tree Frogs on a leaf at the Hotel Bougainvillea, Costa Rica. 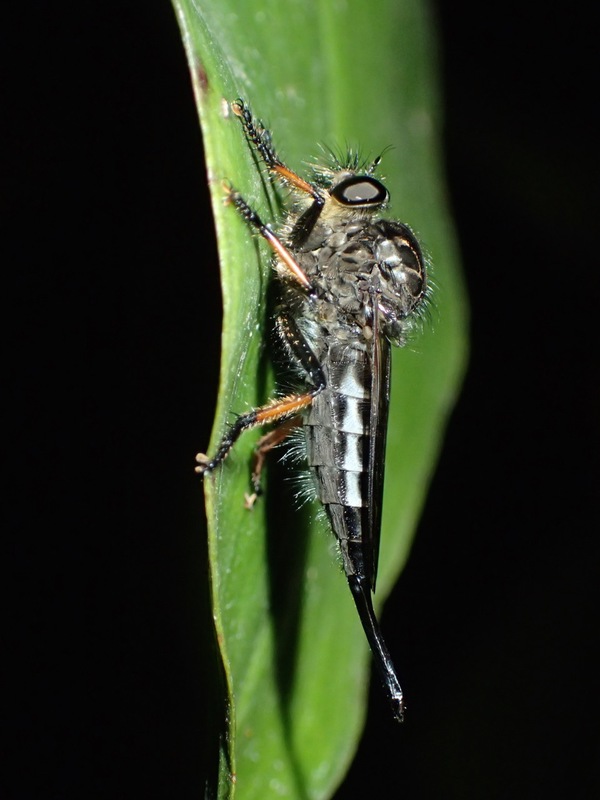 This is one of the interesting small creatures we saw – a Robber Fly (Family Asilidae). 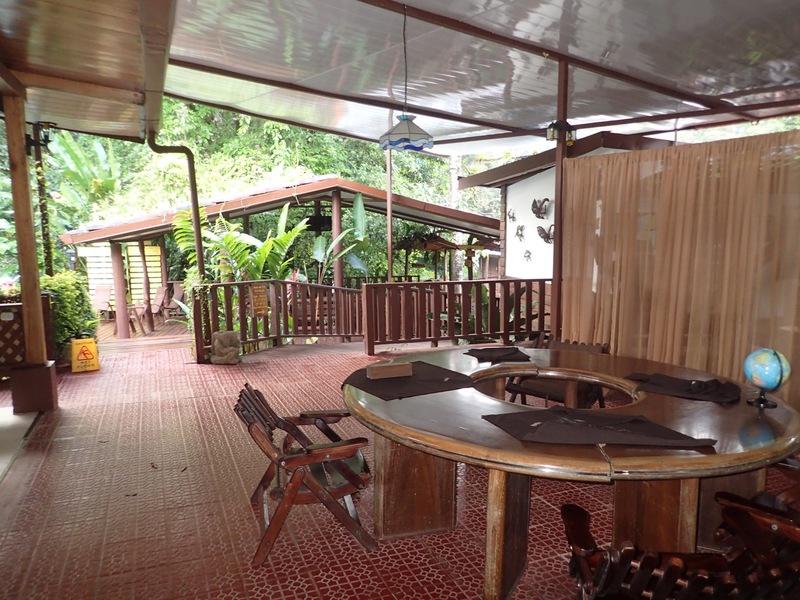 Hotel Bougainvillea, Costa Rica. 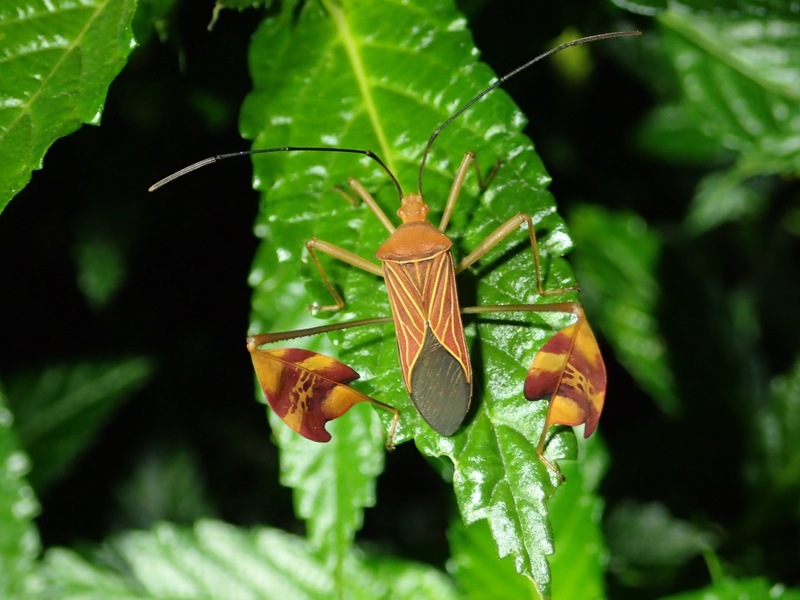 A remarkable Leaf-footed Bug (Family Coreidae) on a plant at the Hotel Bougainvillea, Costa Rica. 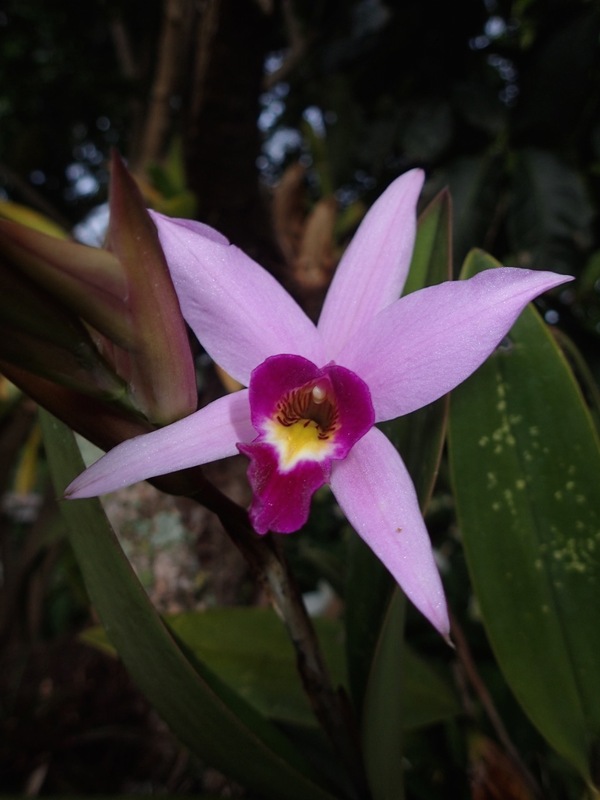 One of the many flowers in bloom in the gardens at the Hotel Bougainvillea, Costa Rica. This one is a large orchid. 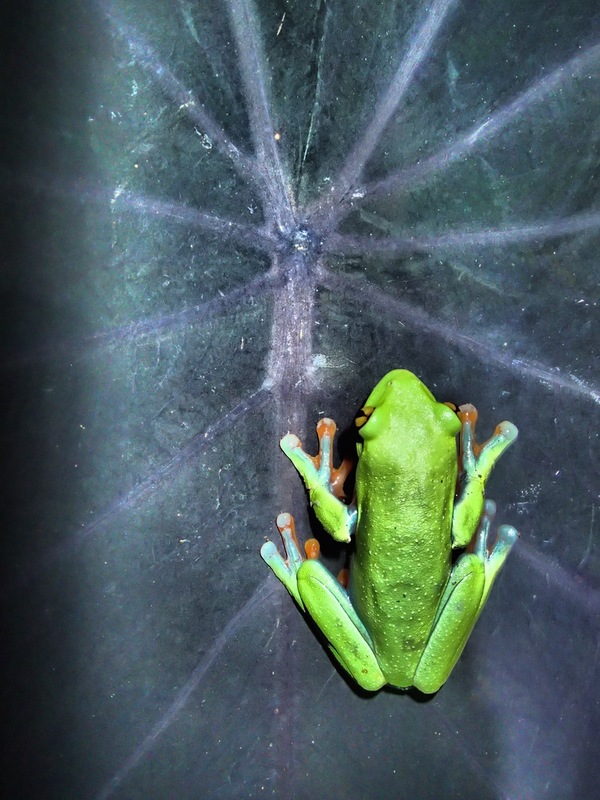 Golden-eyed Tree Frog – photo was taken using a built in filter on my Olympus TG-3. Cool effect! 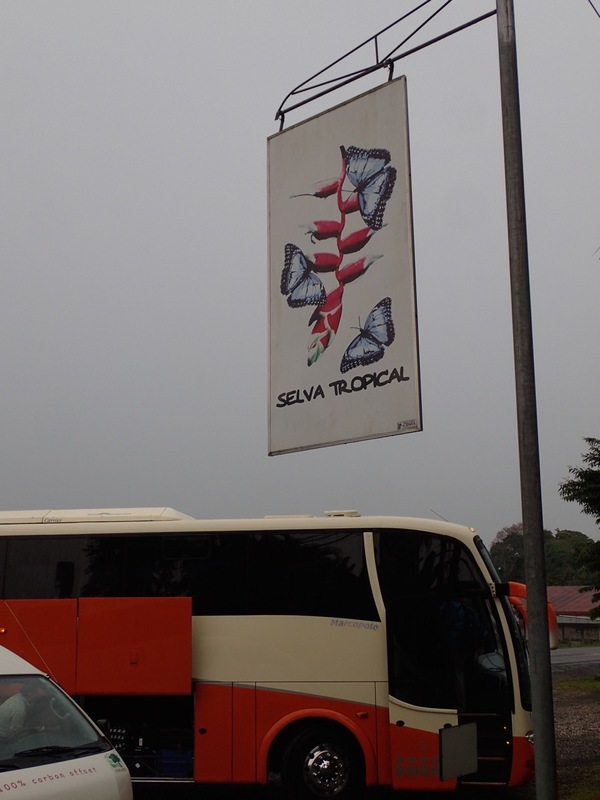 Sign for the Selva Tropical restaurant. 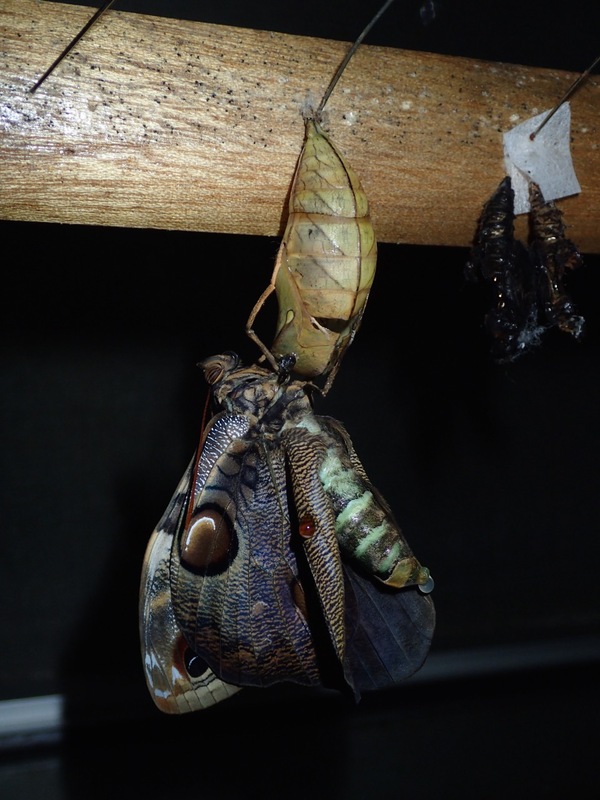 A Morpho butterfly emerges from it’s chrysalis at the butterfly garden at Selva Tropical. 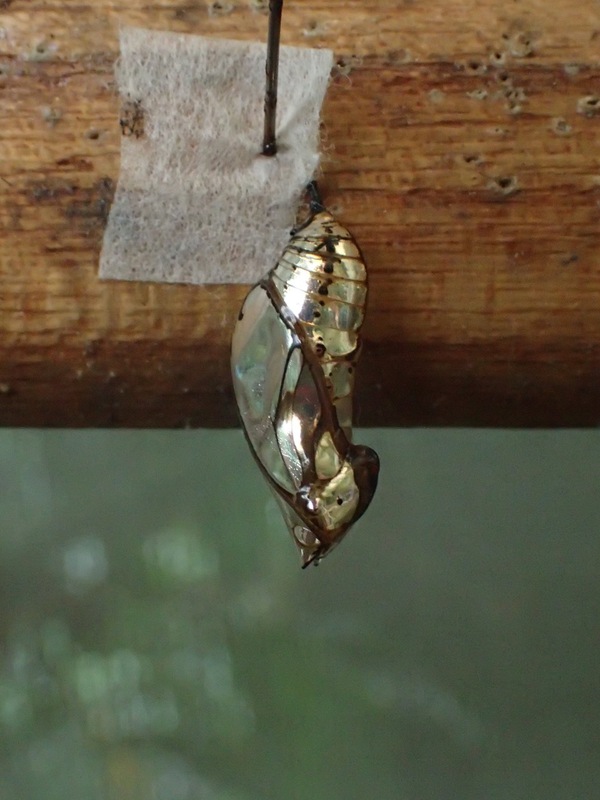 A neat golden-colored chrysalis at the butterfly garden at Selva Tropical. 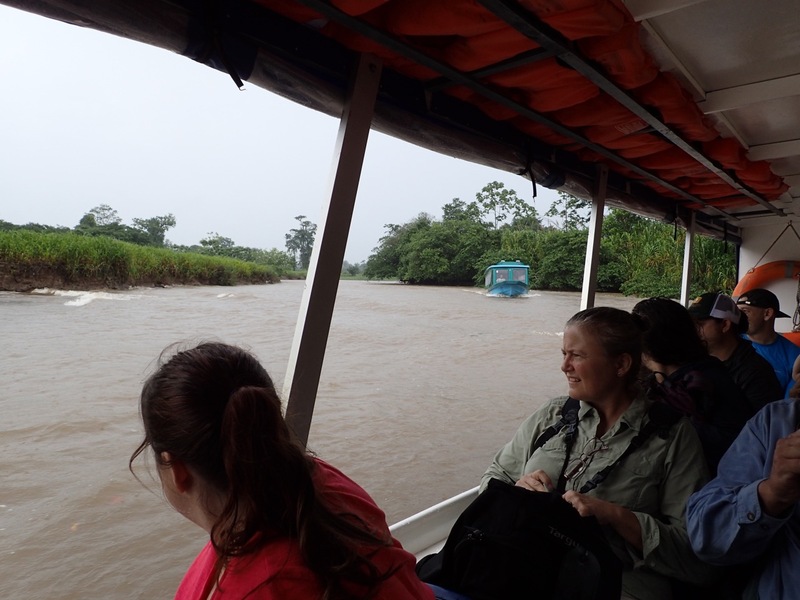 After breakfast, we headed out again via bus to La Pavona, our departure point to head to Tortuguero by boat. 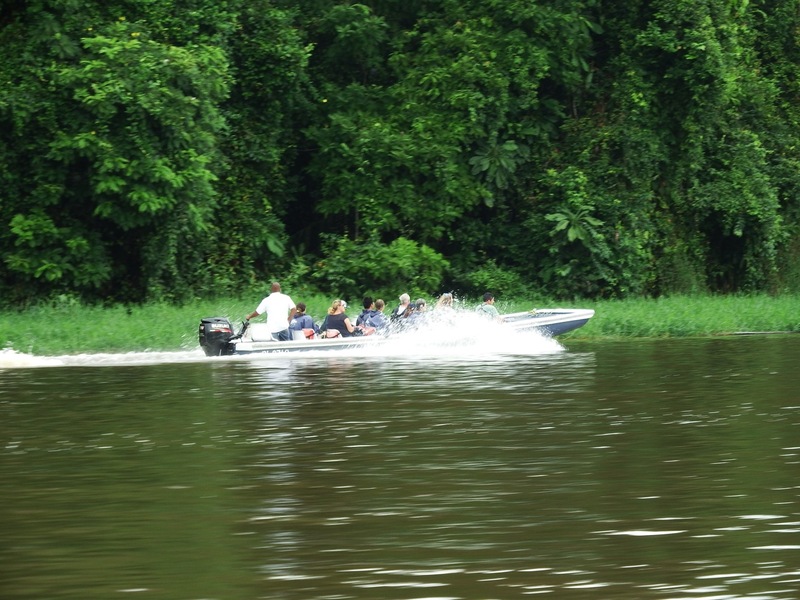 There are a remarkable series of canals that interconnect (and four rivers that merge into the area around Tortuguero) and are used extensively by the boats pictured below – to transport not only people but supplies and other goods. 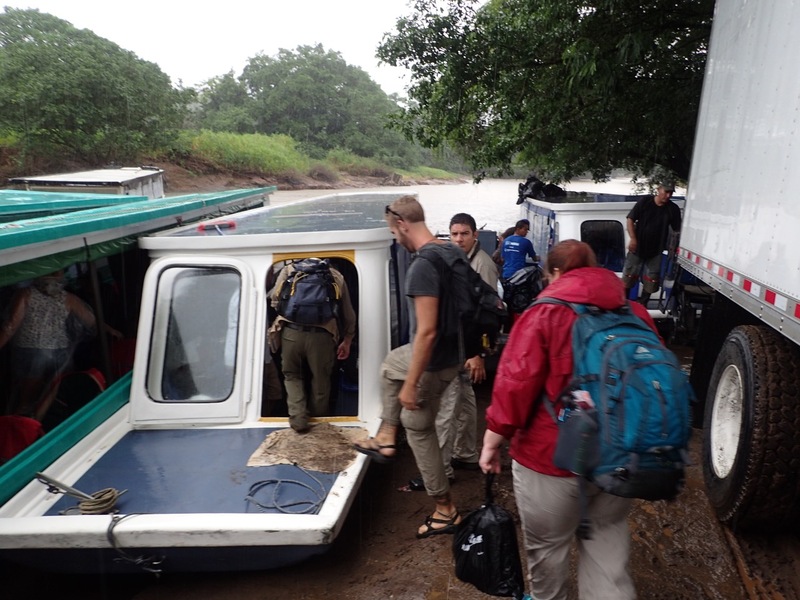 Loading onto the boats at La Pavona to transport us to Laguna Lodge in Tortuguero, Costa Rica. 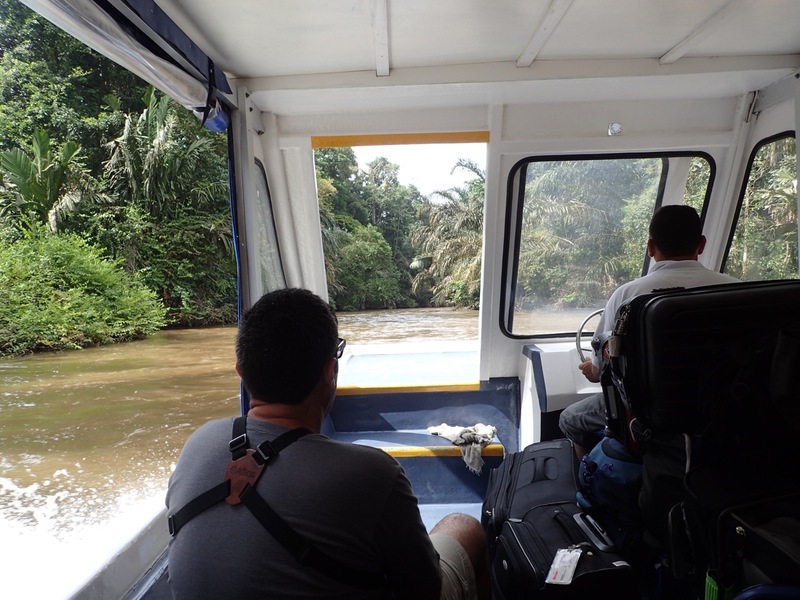 The boat ride to Tortuguero…like a real life Pirates of the Caribbean ride – except no pirates…. 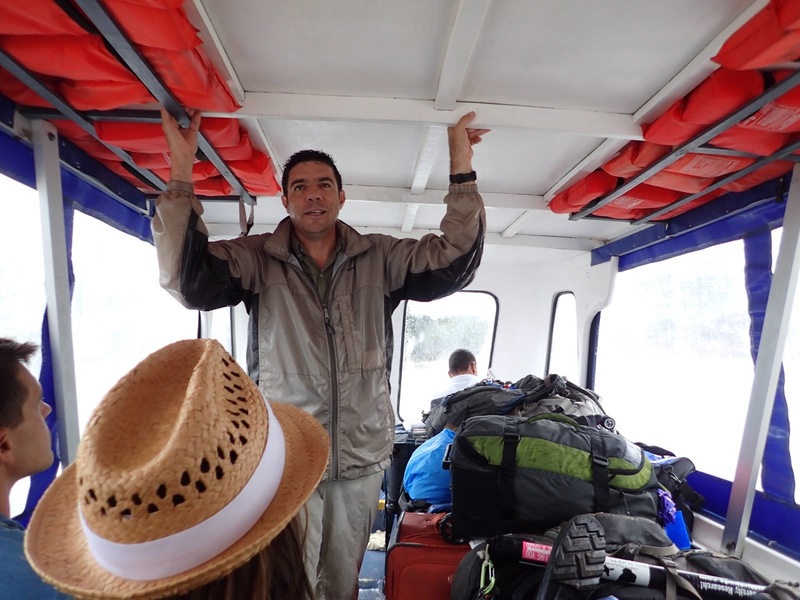 Carlos talks to us about Tortuguero during our boat ride to the area. 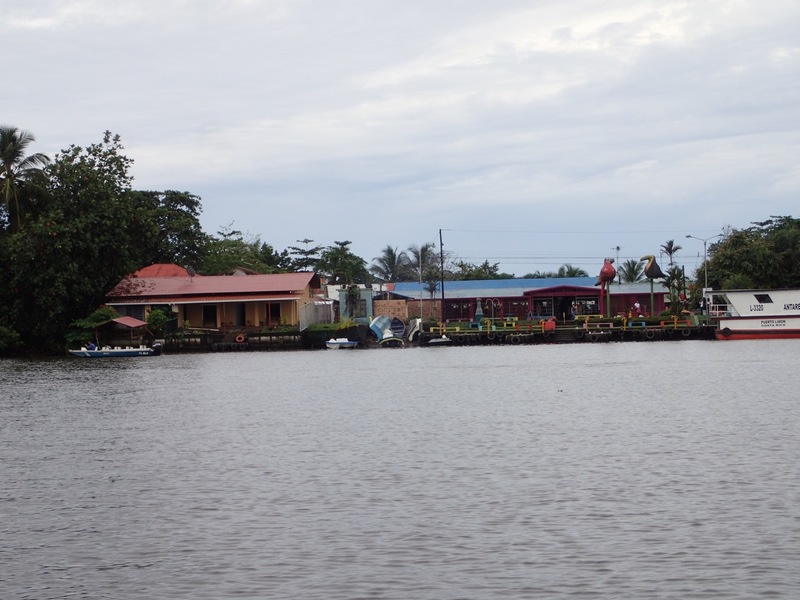 A view of the dockside entrance to Tortuguero Town, Costa Rica. 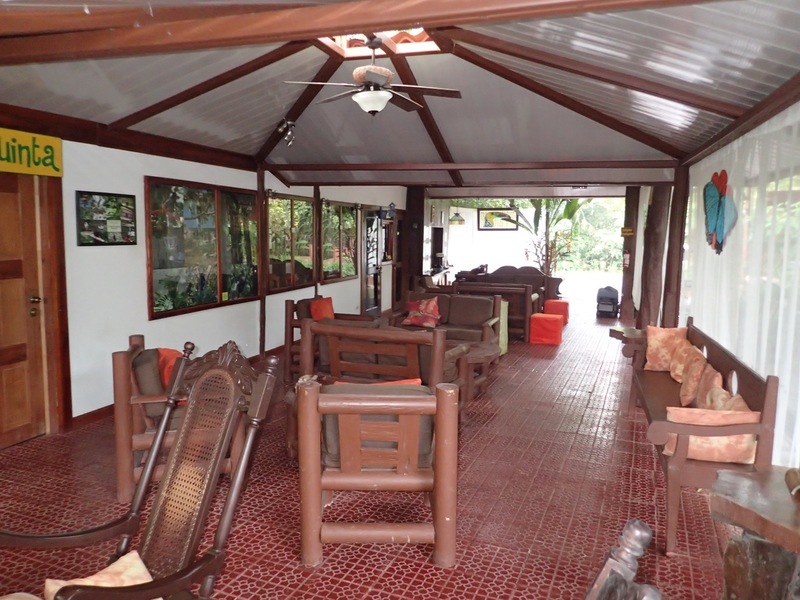 Laguna Lodge is located almost two miles north of the town of Tortuguero. After checking in, we had lunch then went into town to check the place out. 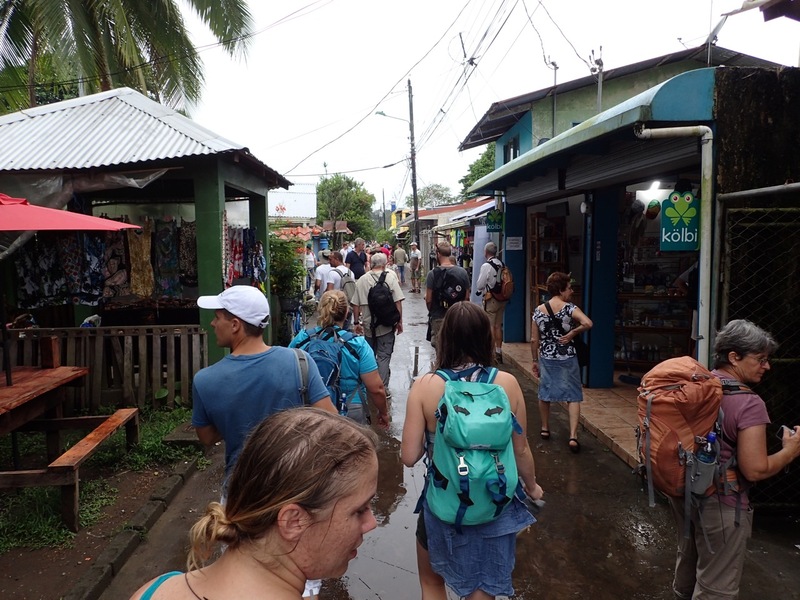 Walking through the town of Tortuguero, Costa Rica. 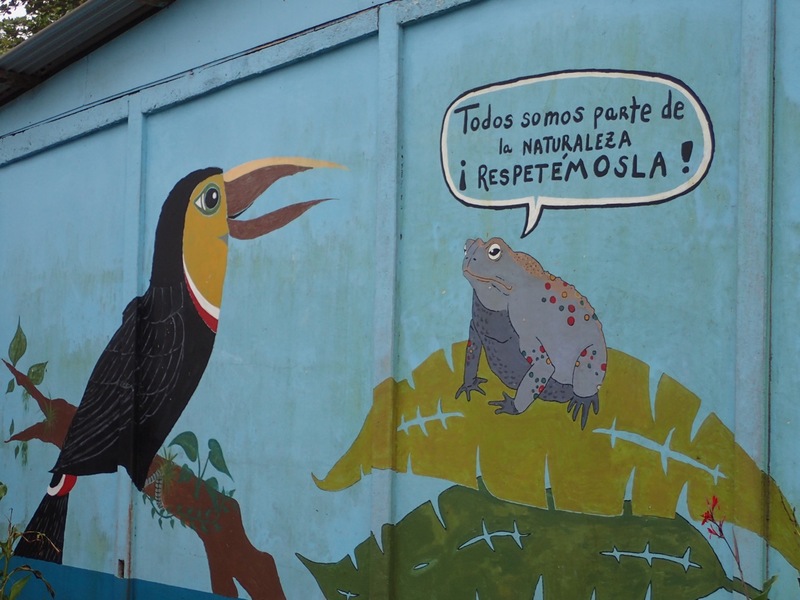 A cool mural on one of the walls of the school in Tortuguero, Costa Rica. 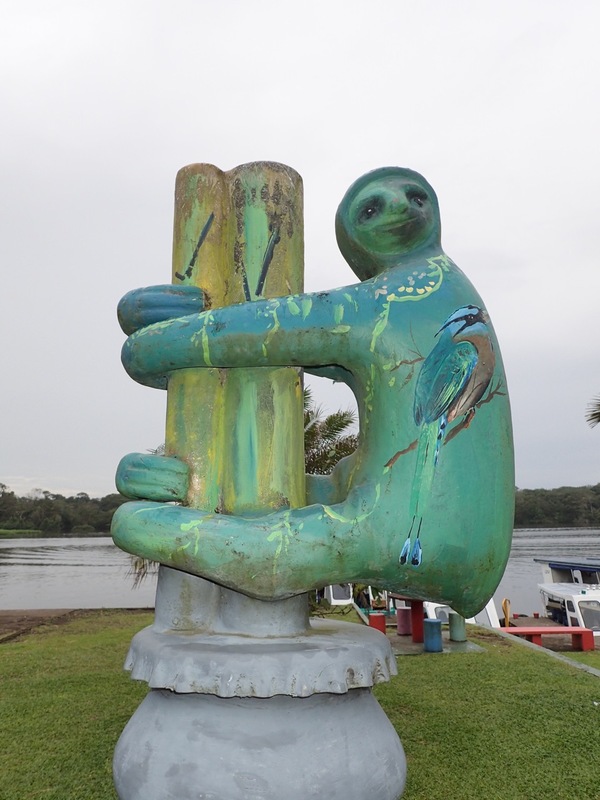 A funny thing happened while we were walking in Tortuguero town. A guy passed us with a wheel barrow containing coconuts. 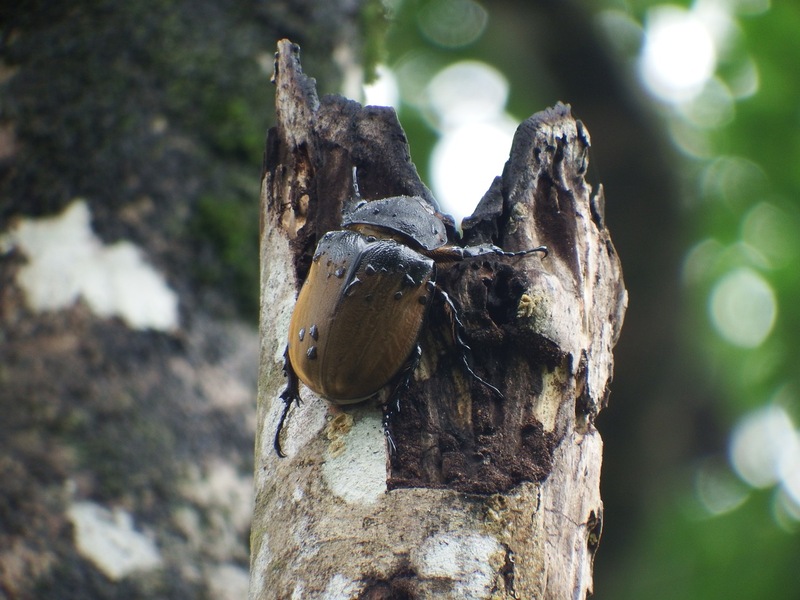 After he had passed us, one of our group said, “…did you see that rhino beetle in that wheelbarrow?”. This led to a short chase down the street yelling “Señor” until he finally realized that we were talking to him. Upon asking about the beetle, he broke out in a big grin and told us that these sometimes come into the lights. He then held it out for us to take pictures and to hold it. 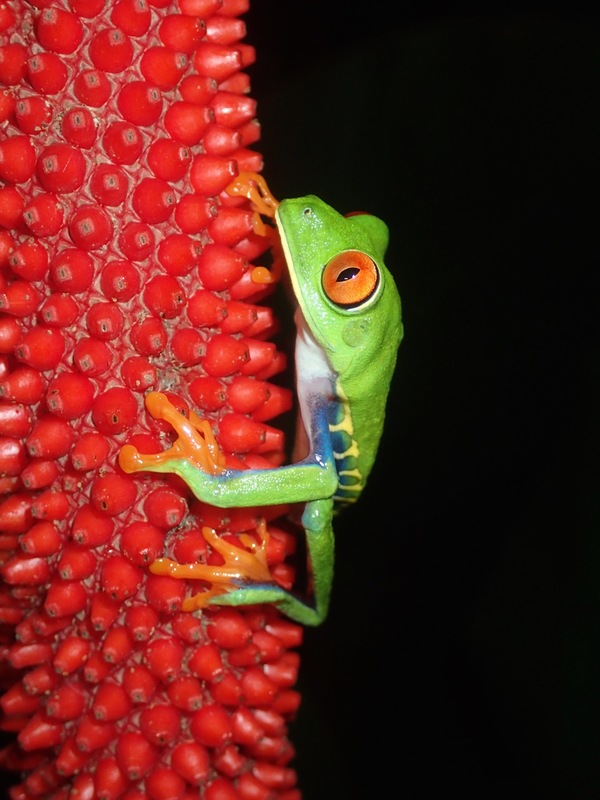 It is feeding on a piece of sugar cane. 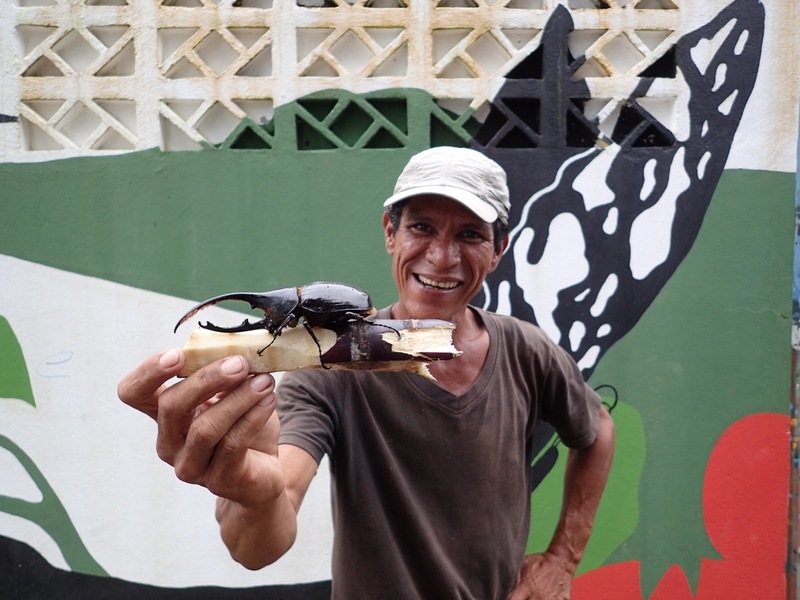 A type of rhinoceros beetle called the Hercules Beetle, held by a coconut vendor in Tortuguero, Costa Rica. 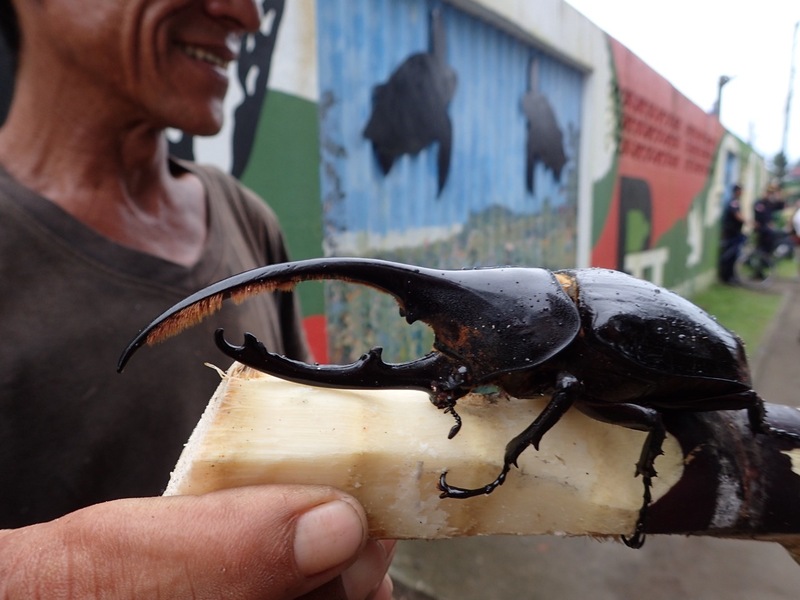 Hercules Beetle on a piece of sugar cane. 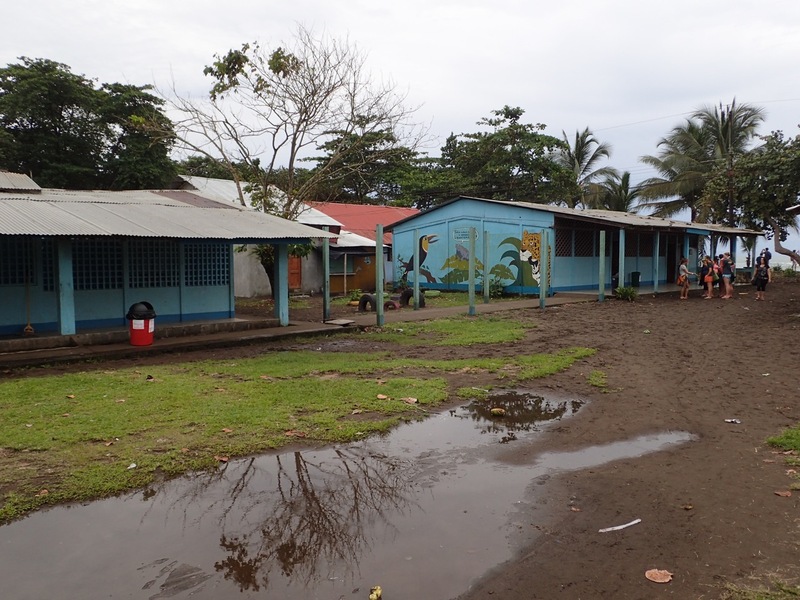 After our brief stay at Tortuguero town, we headed back to Laguna Lodge via the trail that extends along the eastern edge of the peninsula of land where many of the lodges and the town itself are located. The beach for many, many miles is a primary nesting ground for four species of sea turtles: Green, Leatherback, Loggerhead, and Hawksbill Sea Turtles. In the past month, there have been 18 turtles predated by Jaguars along this stretch of beach. 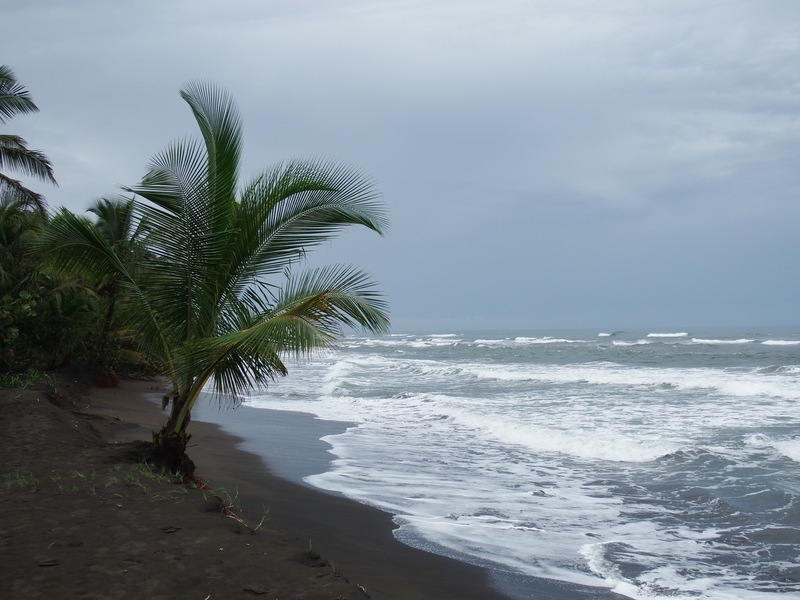 This is the beach to the east of Tortuguero and Laguna Lodge. This extent of beach along northern Costa Rica is an immensely important nesting ground for multiple species of sea turtles. A female Rhino or Elephant Beetle…this one was at the top of a snag and measured approximately at least 3-inches in length. 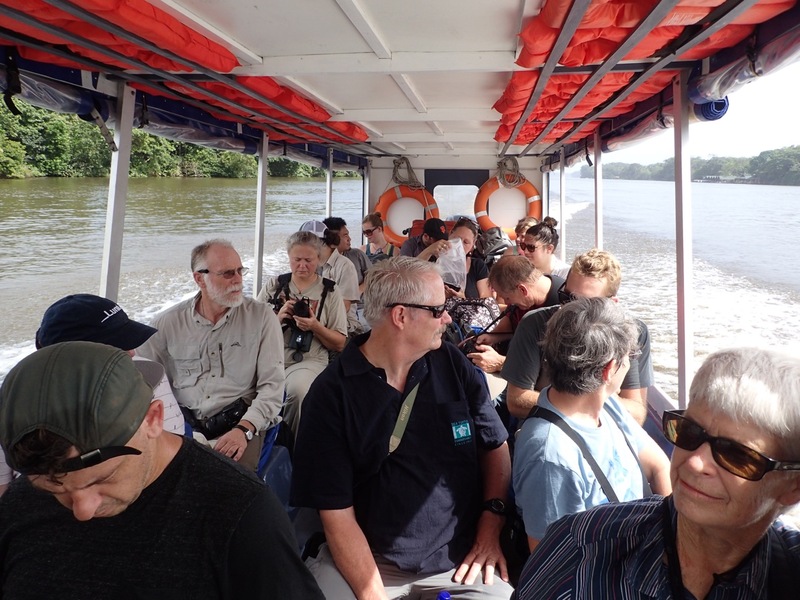 The start of our second day at Tortuguero was a nice opportunity to do some birding. 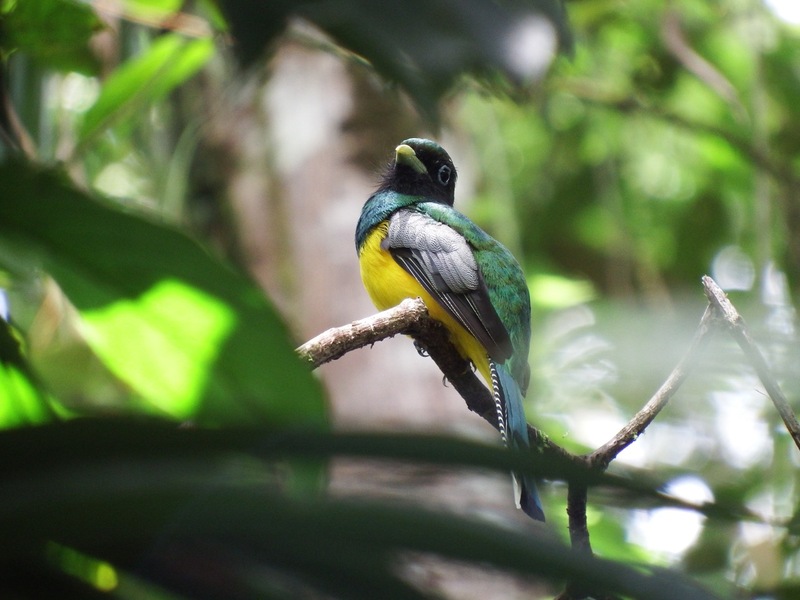 We had also done some birding the afternoon before and got a pretty nice bunch of birds: Olive-throated Parakeet, Montezuma Oropendola (a nesting colony is present at the lodge), Blue-gray Tanager, Social Flycatcher, Great Kiskadee, Short-billed Dove, Mealy Parrot, Red-lored Parrot, Great-tailed Grackle, Green Heron, and…an awesome bird – the Black-mandibled Toucan! 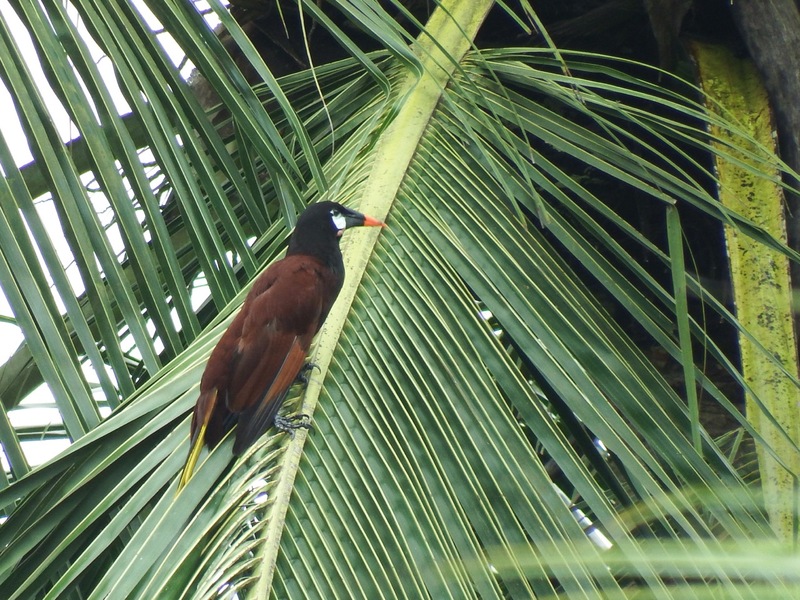 This is a Montezuma’s Oropendola…a fairly large bird that nests colonially. 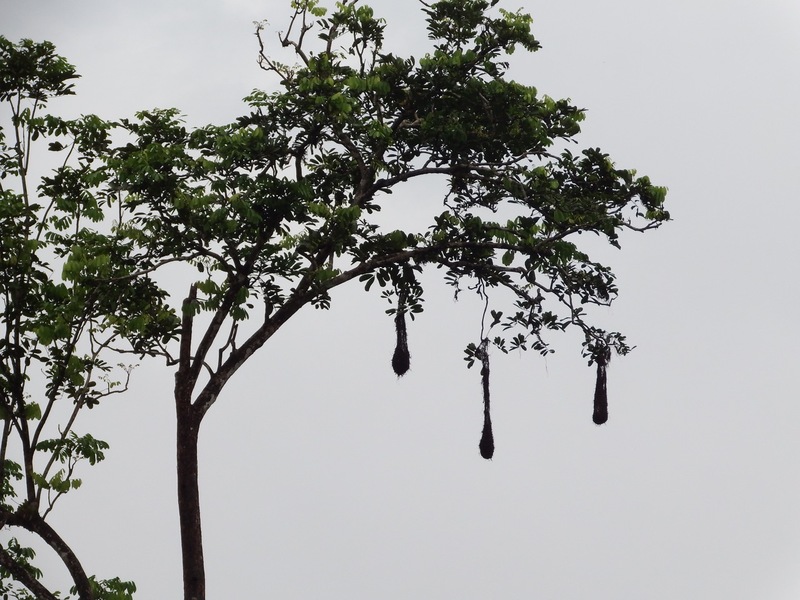 These are the nests of the Montezuma’s Oropendola…they are woven by the bird from grass and other items and hang from the tree to make them less accessible to predators. 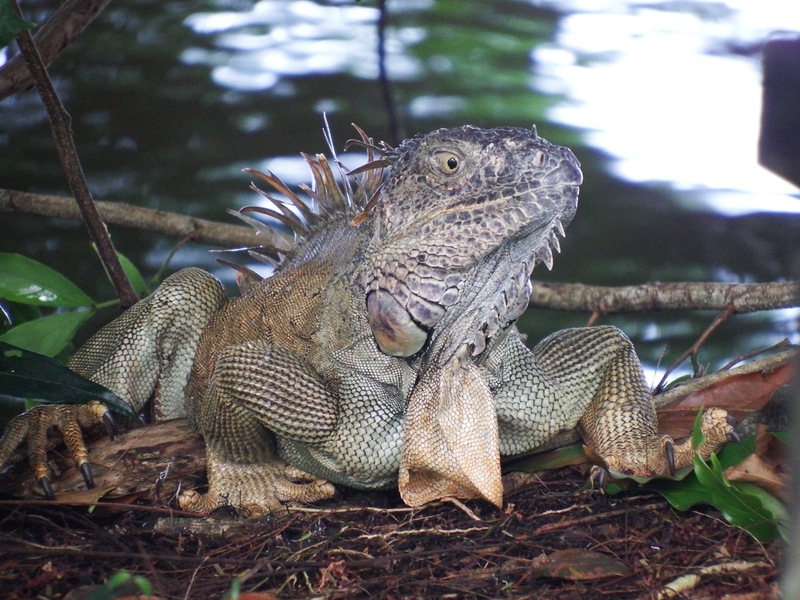 They are large too…measuring upwards of 3-feet in length. 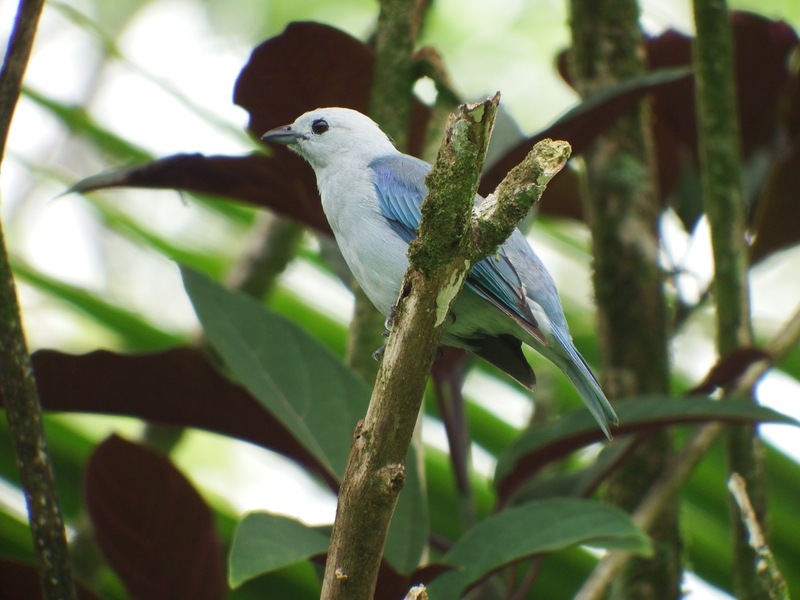 Blue-gray Tanager – a bird we often saw. 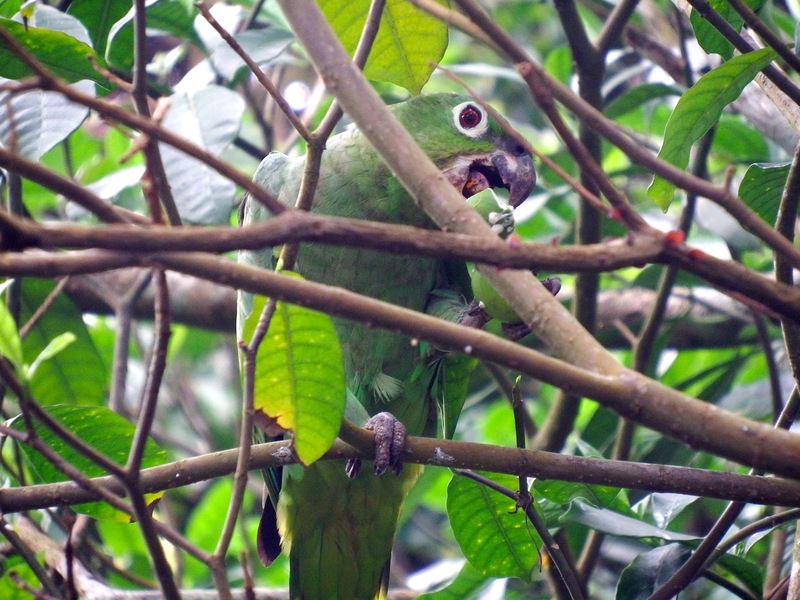 Mealy Parrot eating some kind of fruit. 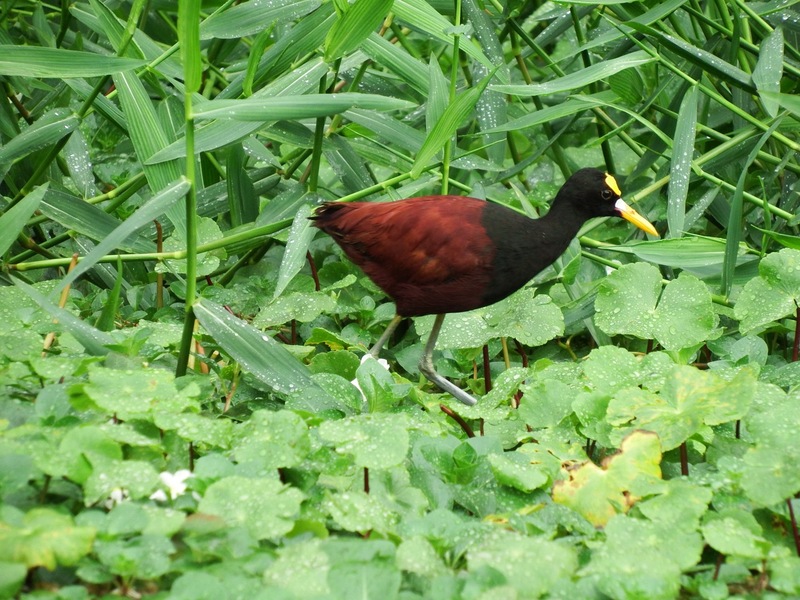 This bird was about 25 feet away and although it didn’t seem upset by our presence, it certainly kept an eye on us. 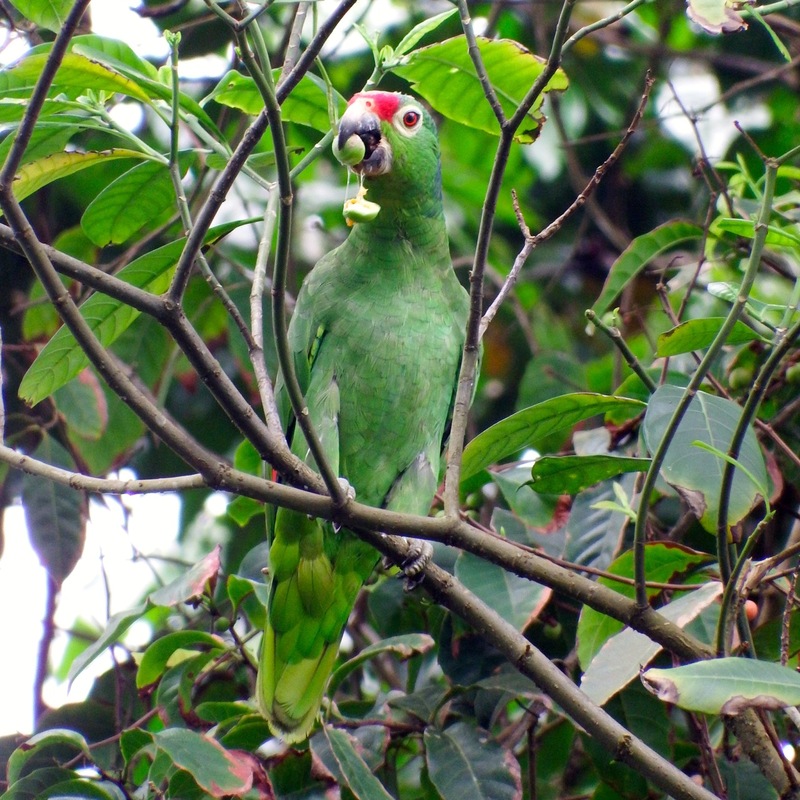 Red-lored Parrot – there was a large flock of these all feeding on fruit and flowers and also chattering up a storm. It was awesome! 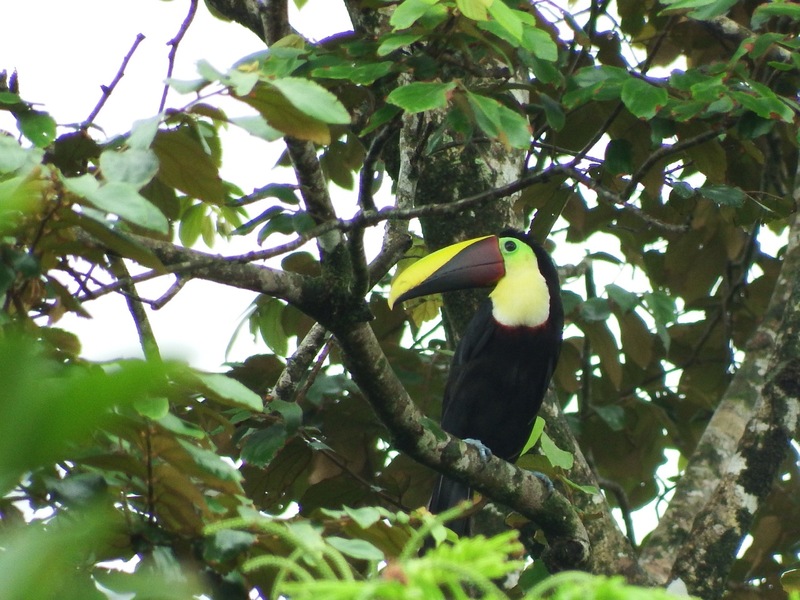 And, here is the crowning sighting our first day at Tortuguero…the Black-mandibled Toucan. 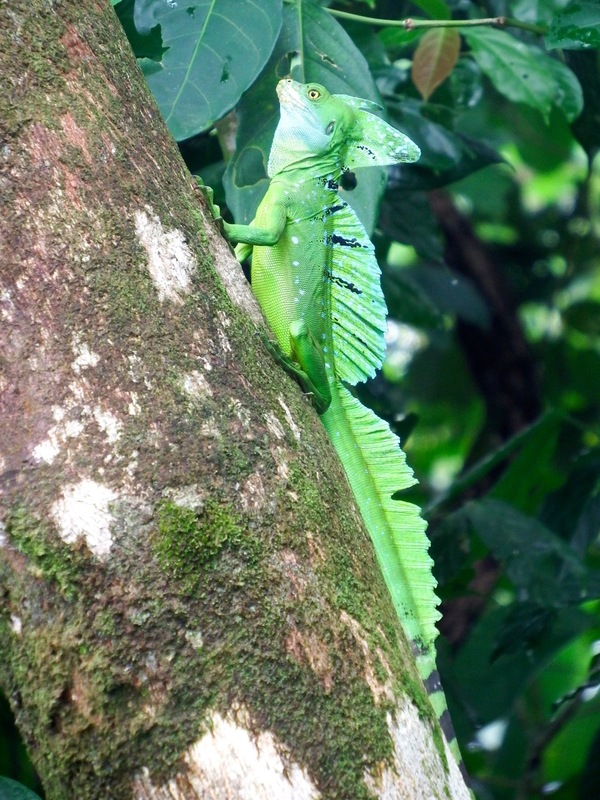 A Green Basilisk…nope, none of us got turned into stone…different kind of basilisk. 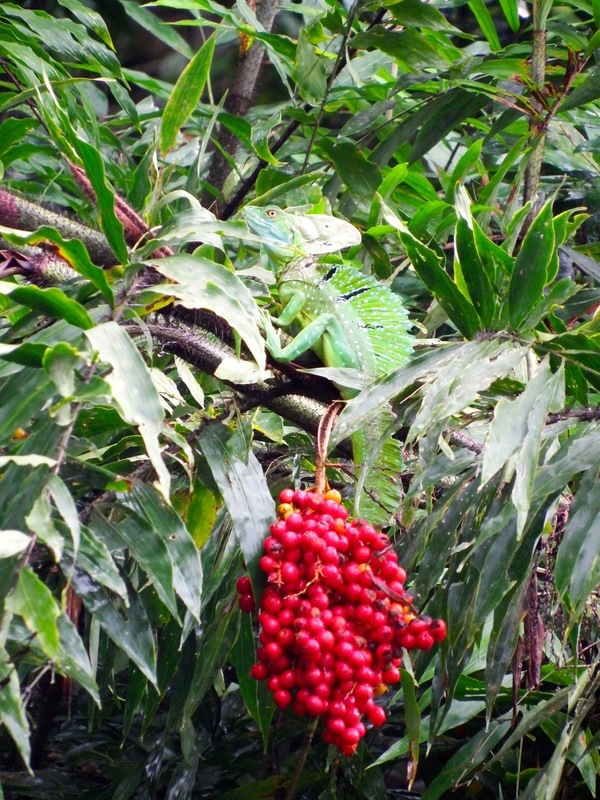 Find the lizard…sort of Christmassy colors! 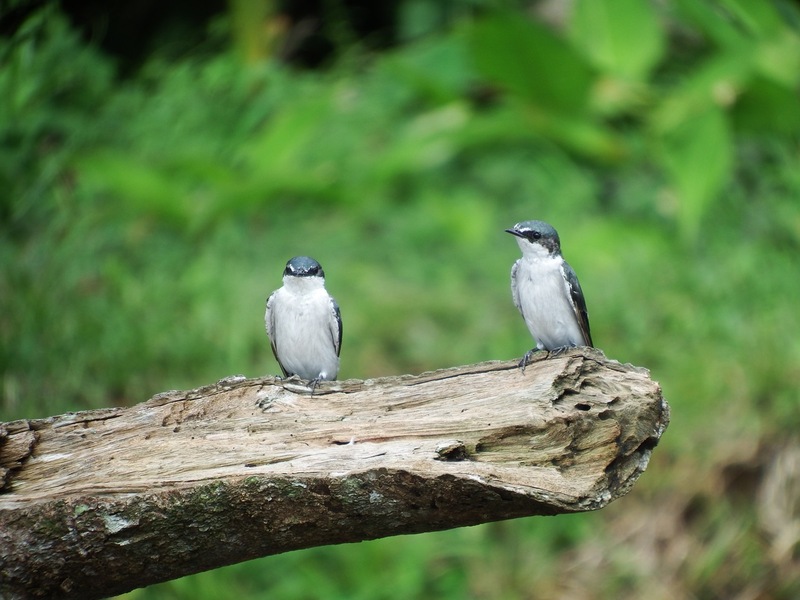 Mangrove Swallows watch us floating by. We also were able to see some very cool mammals. 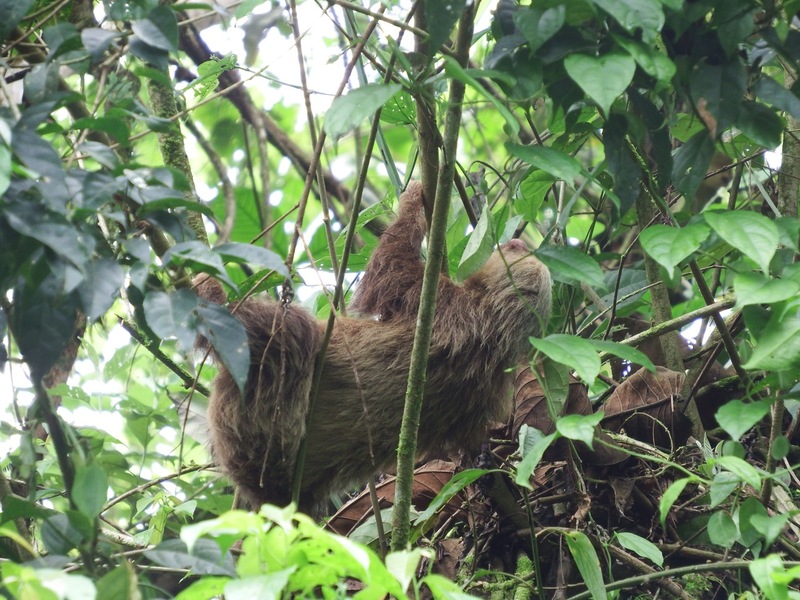 In fact, in the first fifteen minutes of the boat ride, we found a Three-toed Sloth…and it even woke up for us. 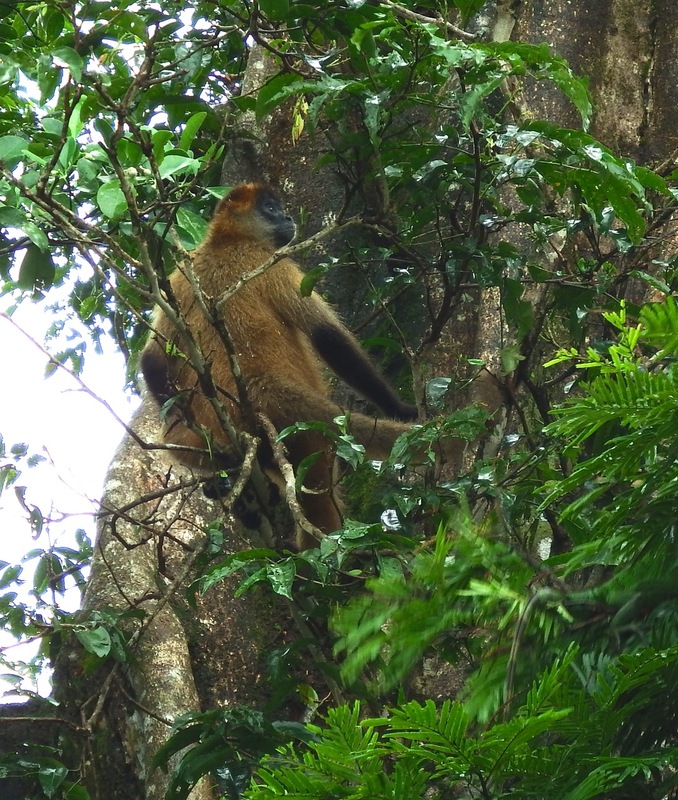 Also saw some primates…Central American Spider Monkeys as well as Mantled Howler Monkeys. 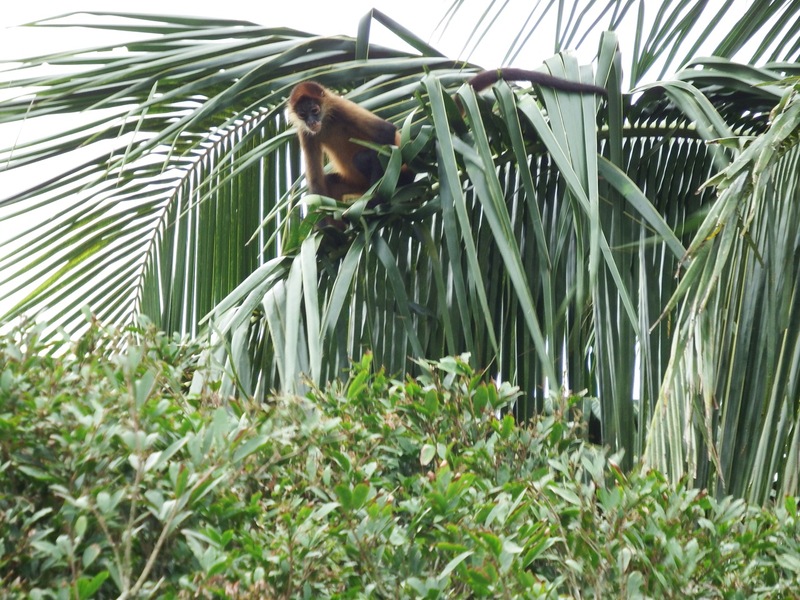 The above monkeys are Central American Spider Monkeys while the below image is of a Mantled Howler Monkey with a youngster on her back. Holy Smokes Batman! 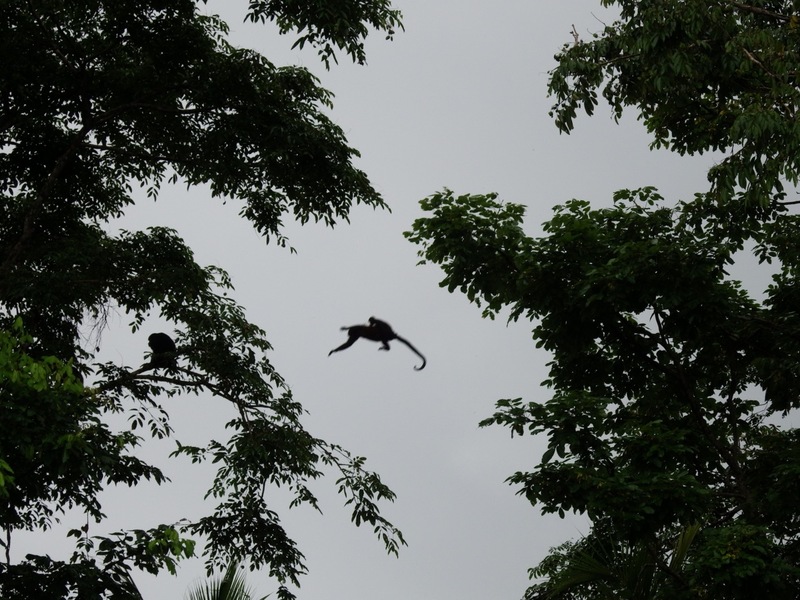 It’s flying monkeys…not quite like the ones from the movie (remember that one…yep, it has a yellow brick road in it) because these do not have little suits! 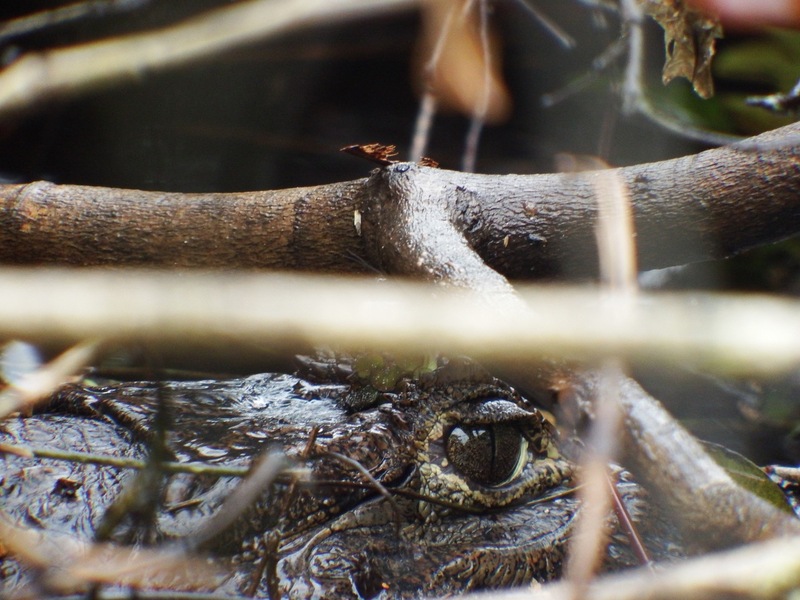 Spectacled Caiman – this one only had a little bit of it showing…and it was about four feet long. 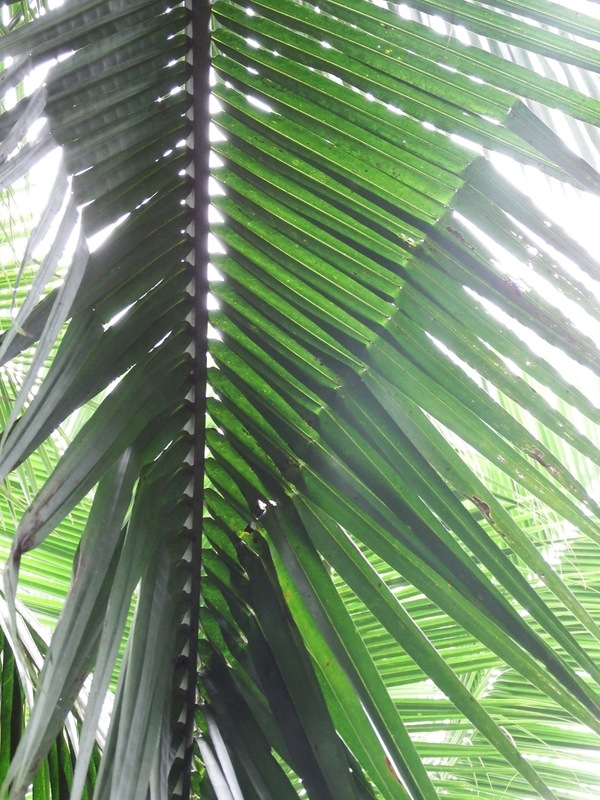 A tent constructed on a coconut palm leaf. Nope, nobody was home…see how the sides droop down from the bites along the leaves that cause punctures in the leaf. 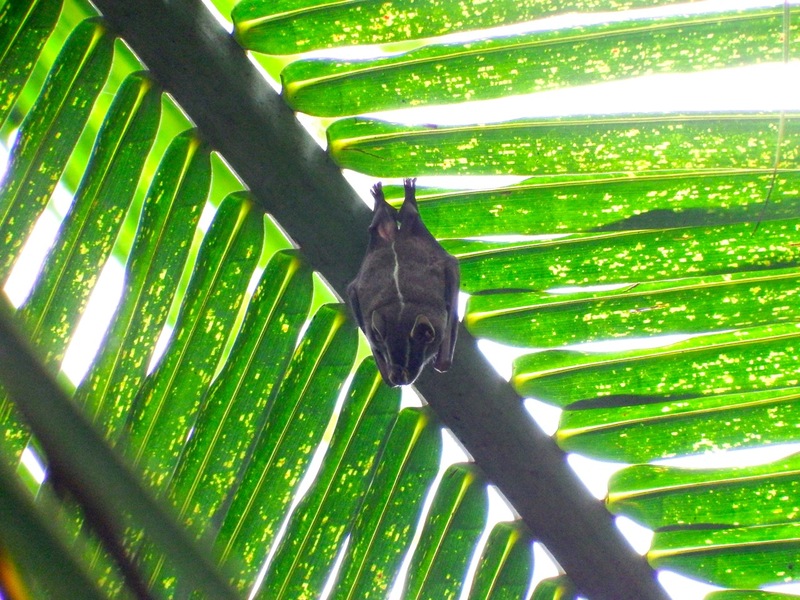 The Common Tent-making Bat (yep, that is the common name)…scientifically it is known as Uroderma bilobatum. 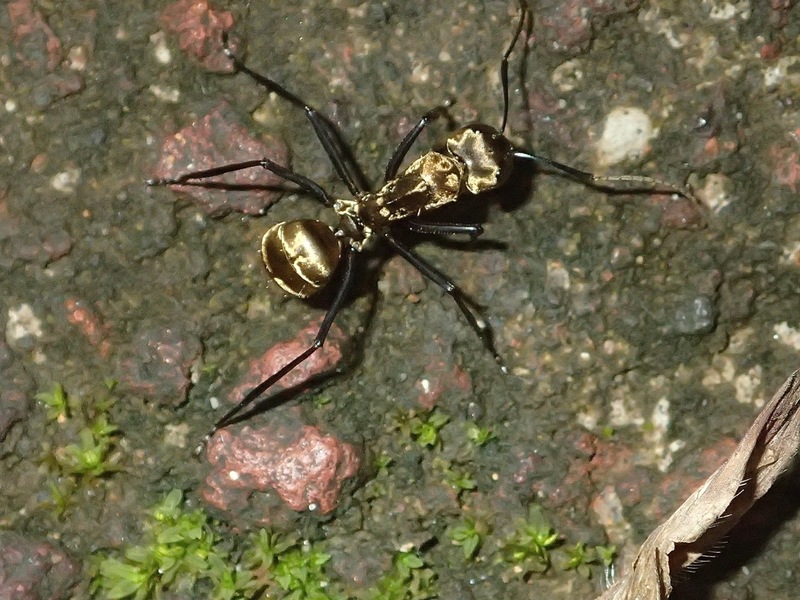 This ant is only about 0.5-inches in length, but that’s not what is cool about it…what is cool is that it is metallic golden in color! 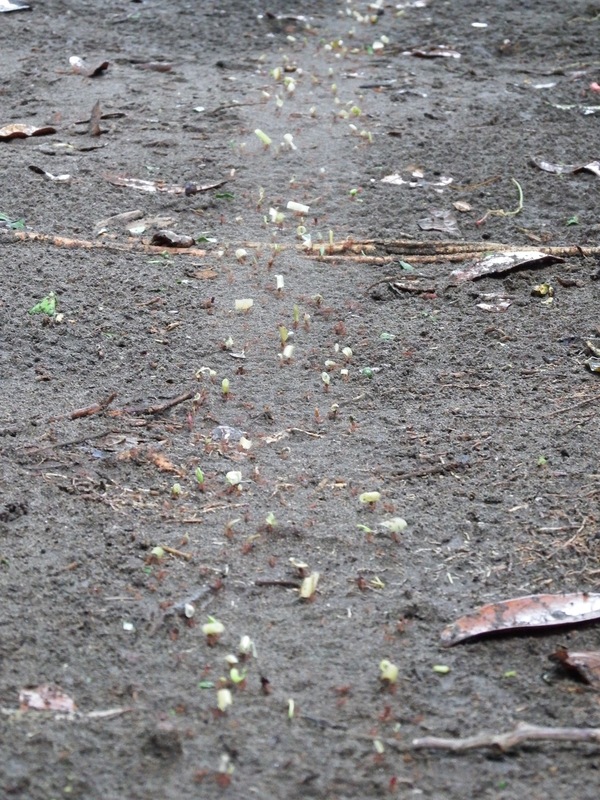 And back to ants – this time the trail of Leaf-cutter Ants. 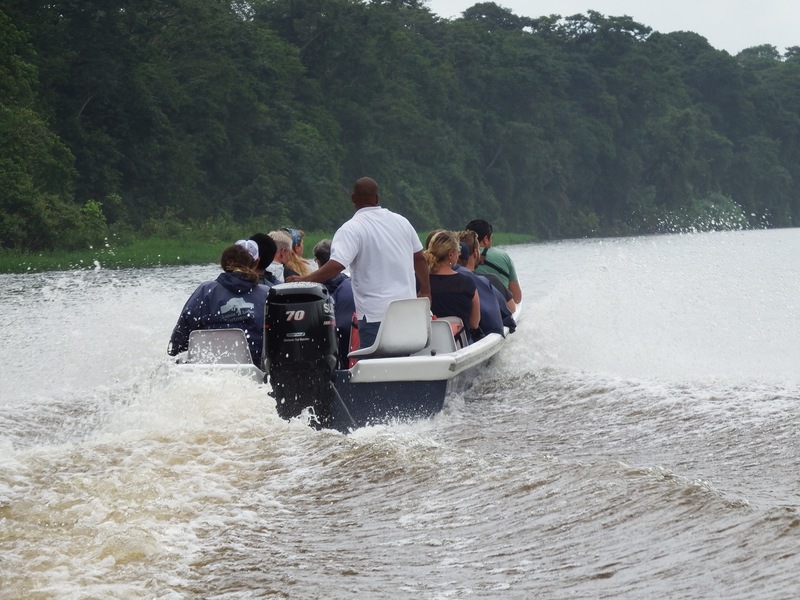 Time to leave Tortuguero…we board the boat and head back to where the bus will pick us up. 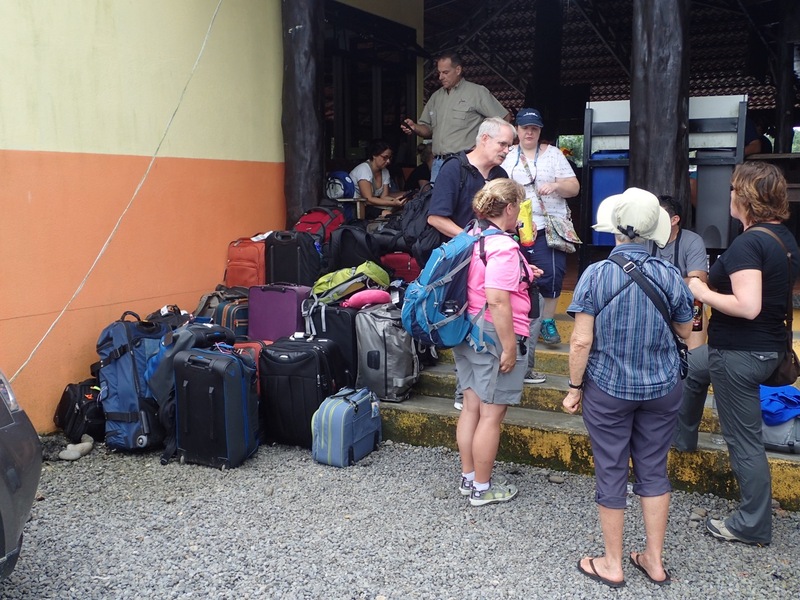 Luggage transfer to the bus after our boat ride from Tortuguero. Hi again…sorry it’s taken so long to get back to you. 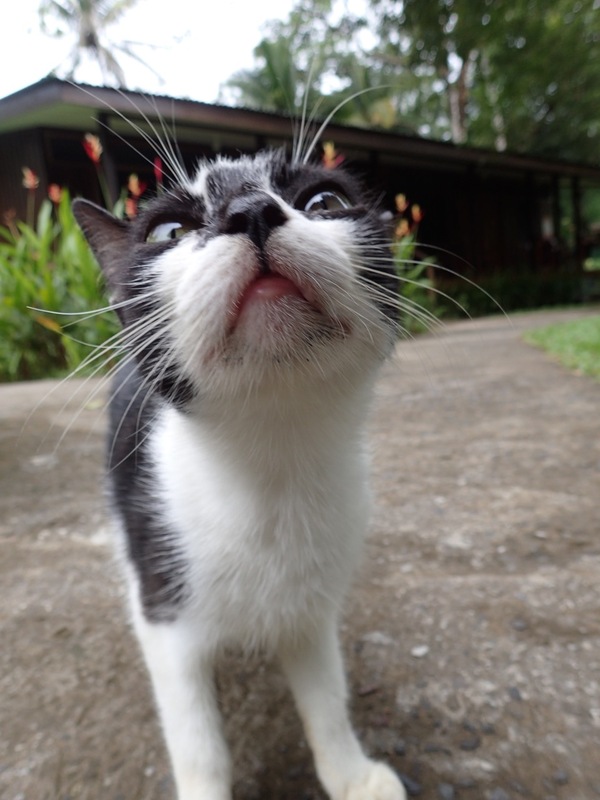 Finally have reasonable internet access in San Jose – not California, but Costa Rica – and can therefore upload pictures. 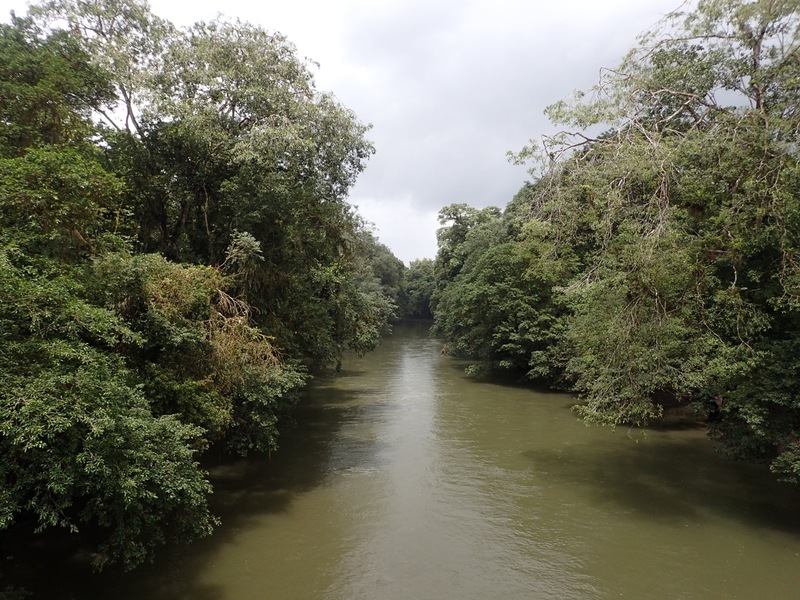 So, we left off where we were journeying from Tortuguero to head to Sarapiqui in the interior of northern Costa Rica. 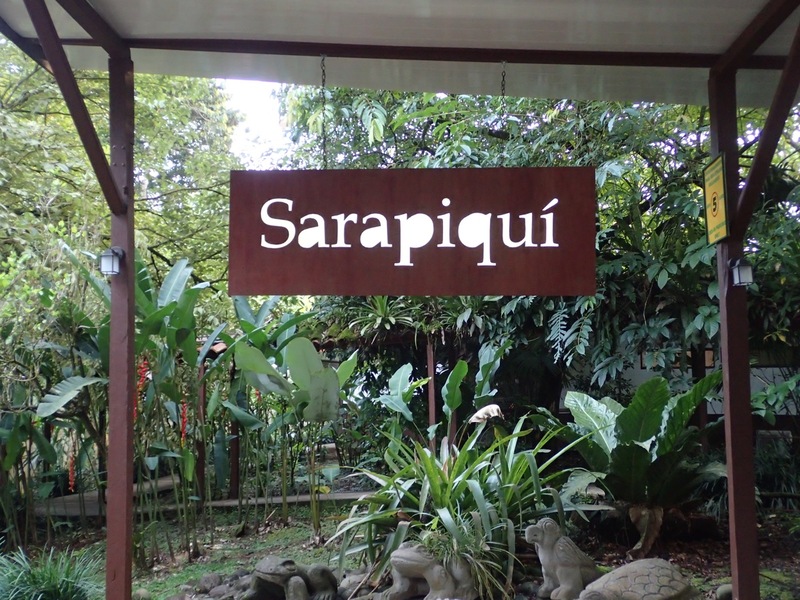 Sarapiqui is a town along it’s namesake, the Sarapiqui River. 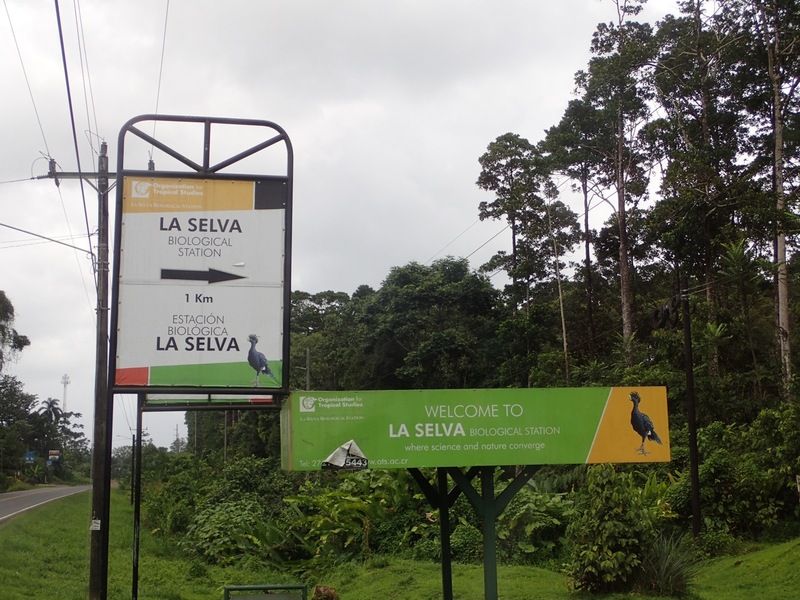 Fantastic place and the home of the famous La Selva Biological Station. 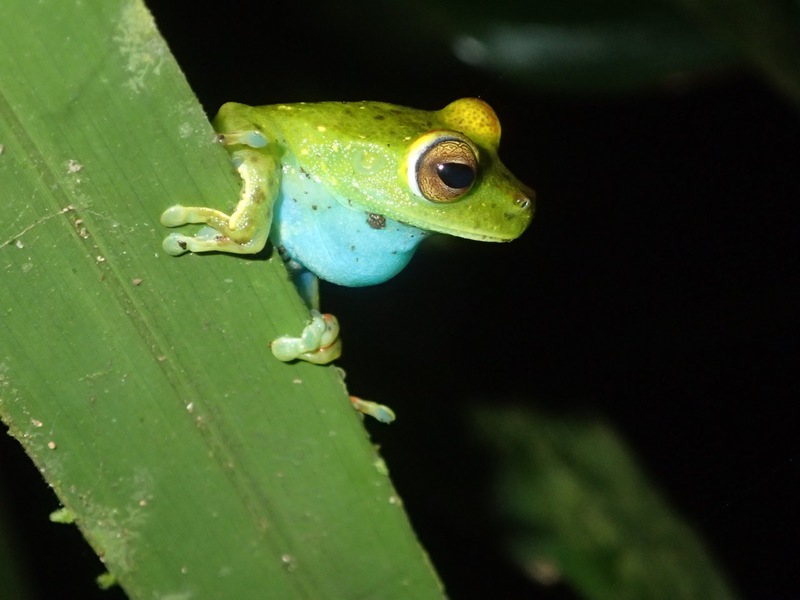 This station is a birthplace for neotropical biodiversity research and at one time, there was one scientific journal paper being published each week from research being conducted at La Selva. 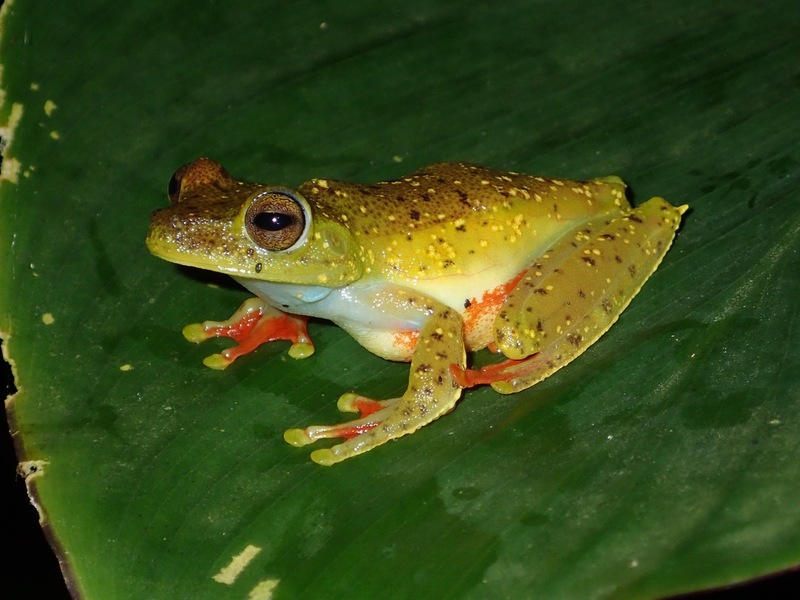 It remains a premier place for rainforest research and has become an important location for climate change studies as it relates to changes in distribution of organisms as the Earth continues it’s fever. 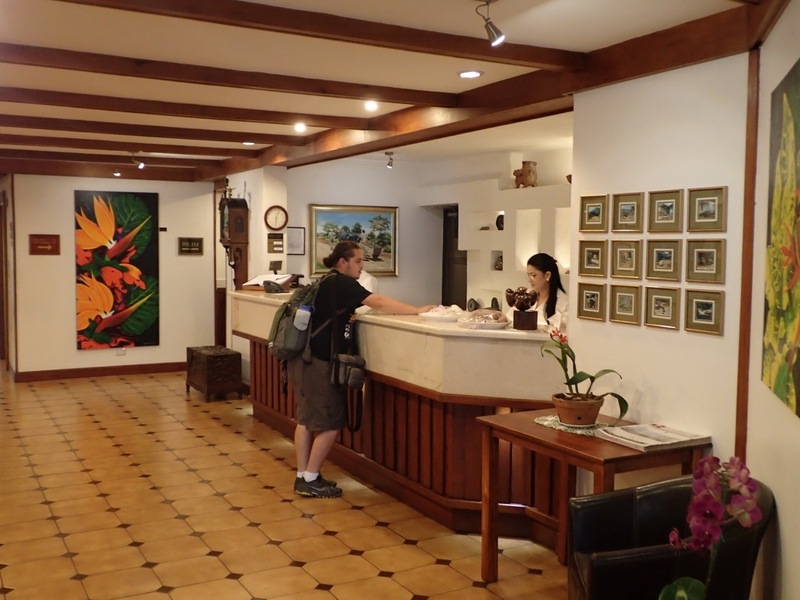 So we checked into the La Quinta lodge in Sarapiqui. 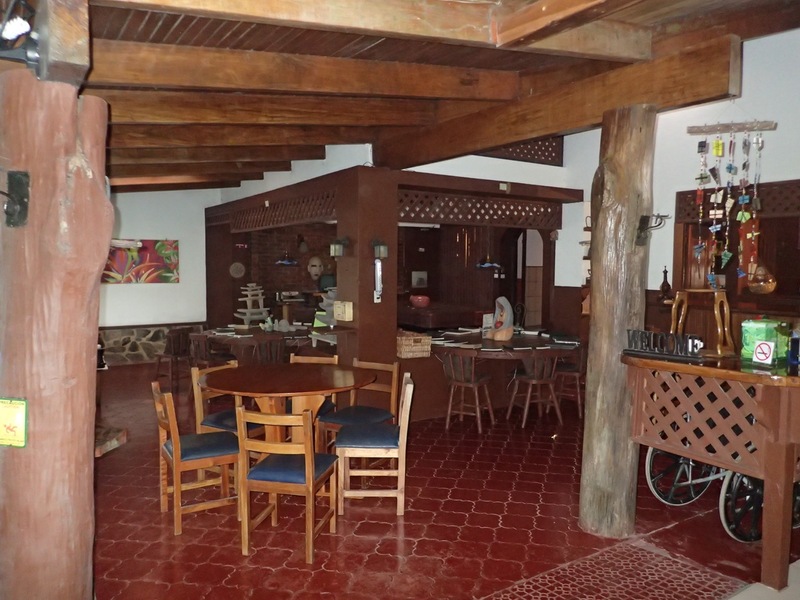 The lobby at La Quinta, Sarapiqui. 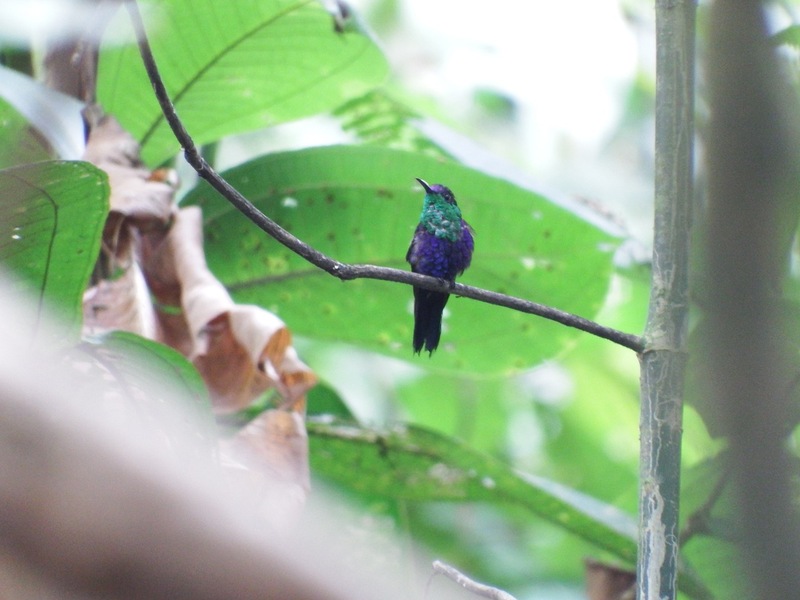 La Quinta, Sarapiqui, Costa Rica. 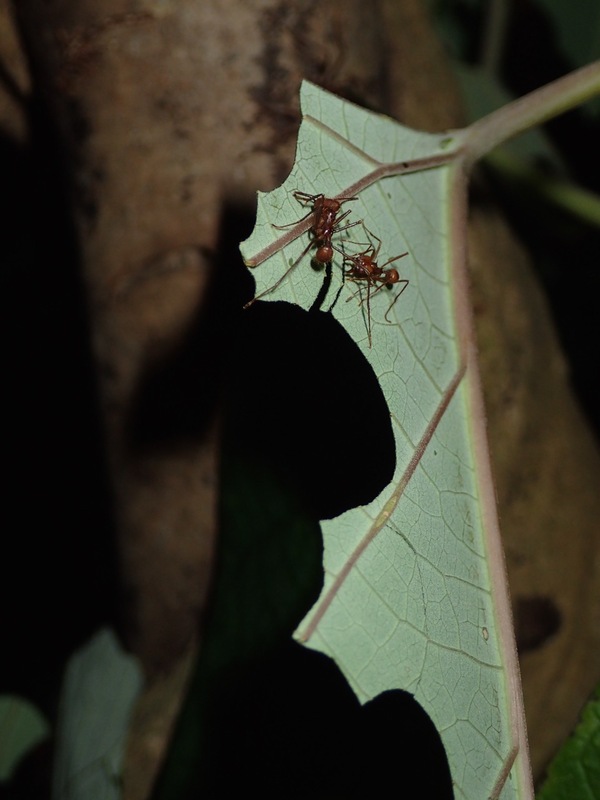 At La Quinta, they have set aside a part of their garden area for a research project on Leaf-cutter Ants. This project is being conducted by a local farmer named Leo – an amazing person who built this entire facility himself. A literal biological Macgyver! 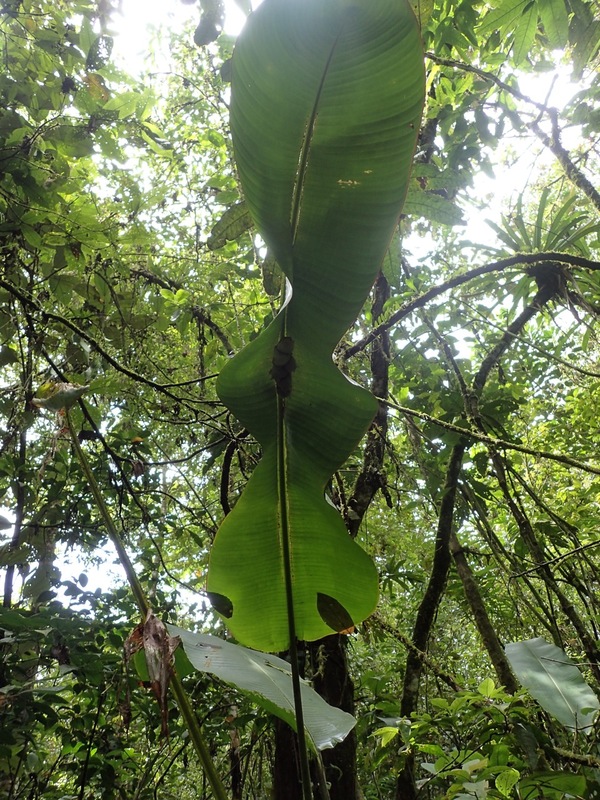 The vines shown below are all associated with one of the Leaf-cutter Ant colonies so that they can travel out to their food resource and come back to the nest without wandering off anywhere else. These ants then go into a confined facility that has their colony, their “farms”, their eggs and juveniles, etc. This way, he can study the ants without having the colony members wandering off or getting predated or having any myriad of problems associated with a wild population. So very cool!!! 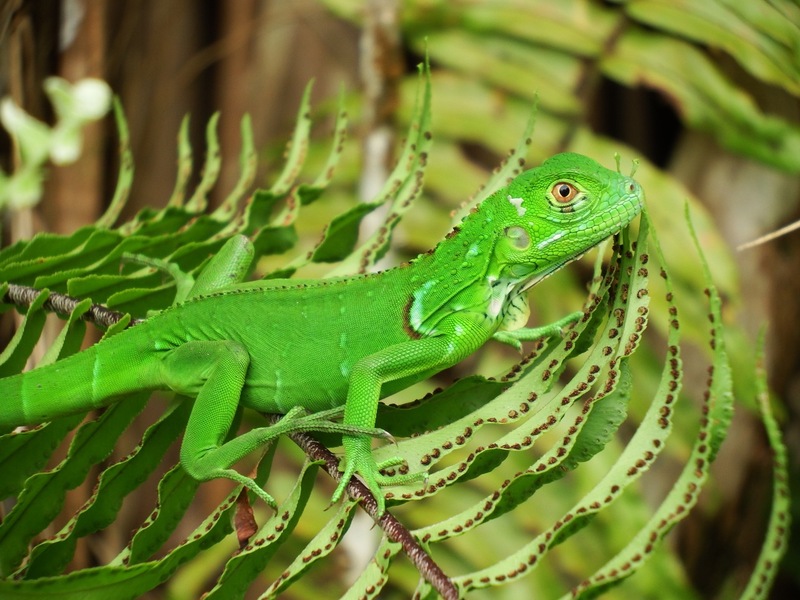 This is a good example of someone who has explored biology on their own and made amazing discoveries in science! A true example of a “Citizen Scientist”. The Leaf-cutter Ant research facility at La Quinta, Sarapiqui, Costa Rica. 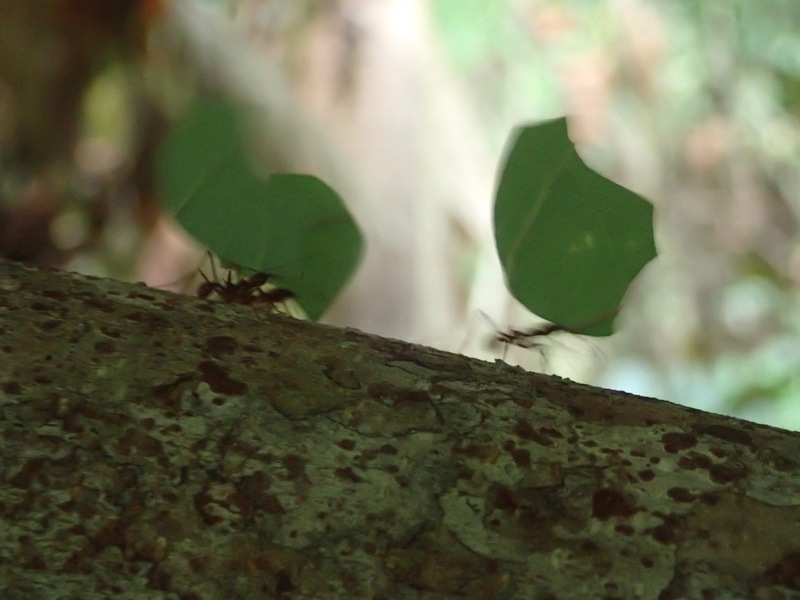 Leaf-cutter Ants transporting leaf segments. 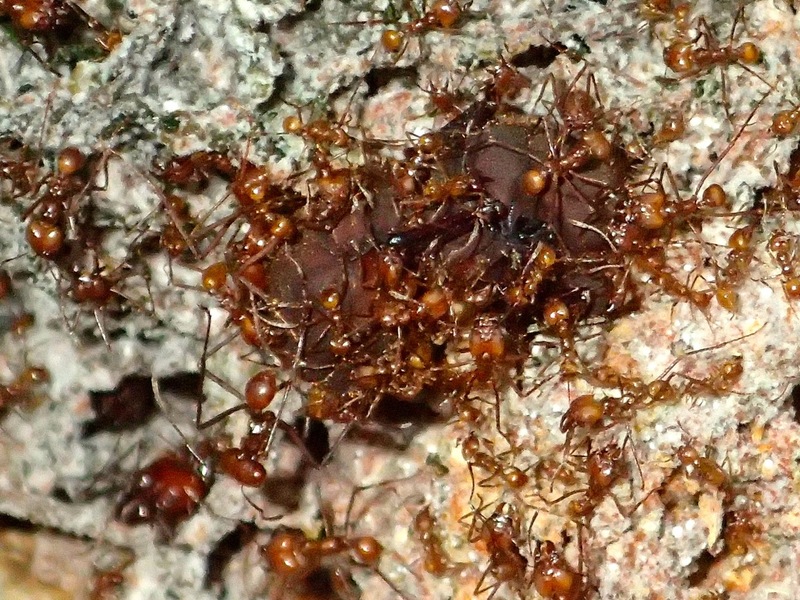 The queen Leaf-cutter Ant surrounded by workers. She is huge compared to the workers and can live for approximately 20 years. 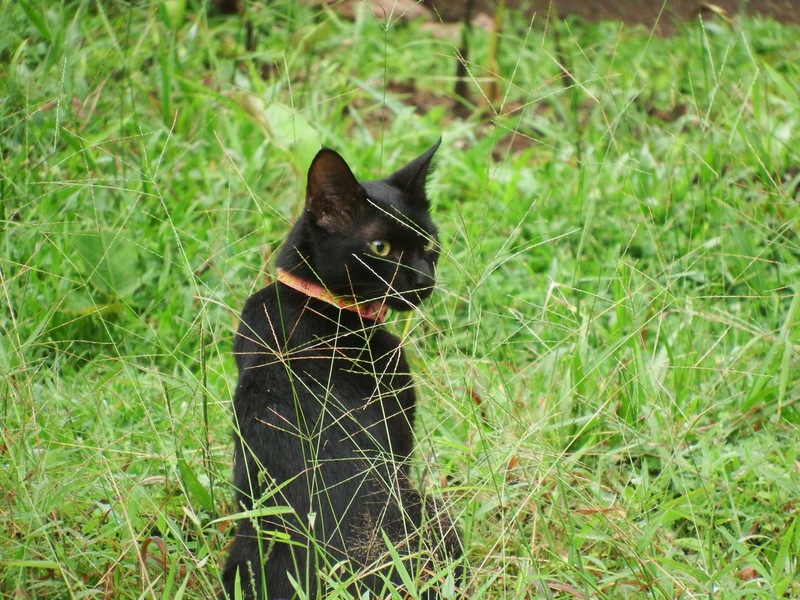 Leo showing the strength of a soldier Leaf-cutter Ant…it is holding onto a piece of wood with its jaws. 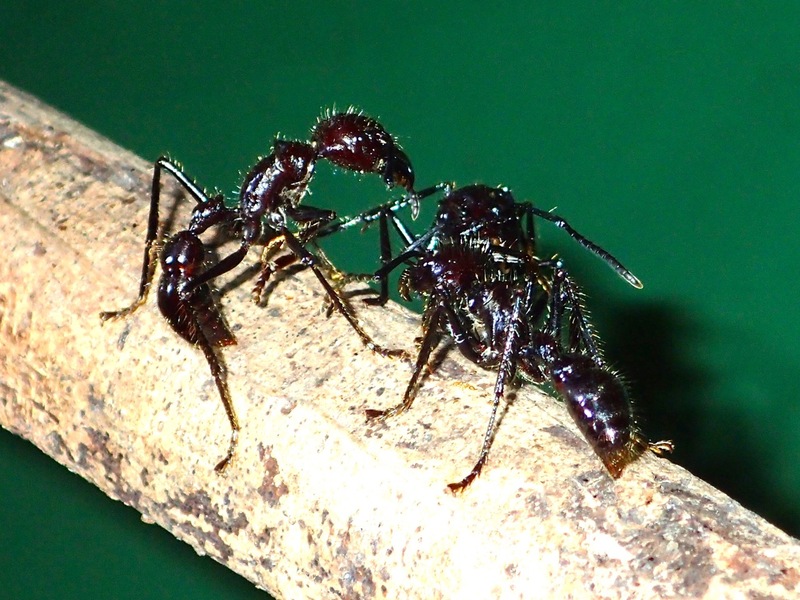 Indigenous people will use soldier ants as “sutures” to close wounds. Bullet Ants – each ant is about one-inch in length and injects a tremendous amount of venom per sting, thus accounting for the excruciating pain. 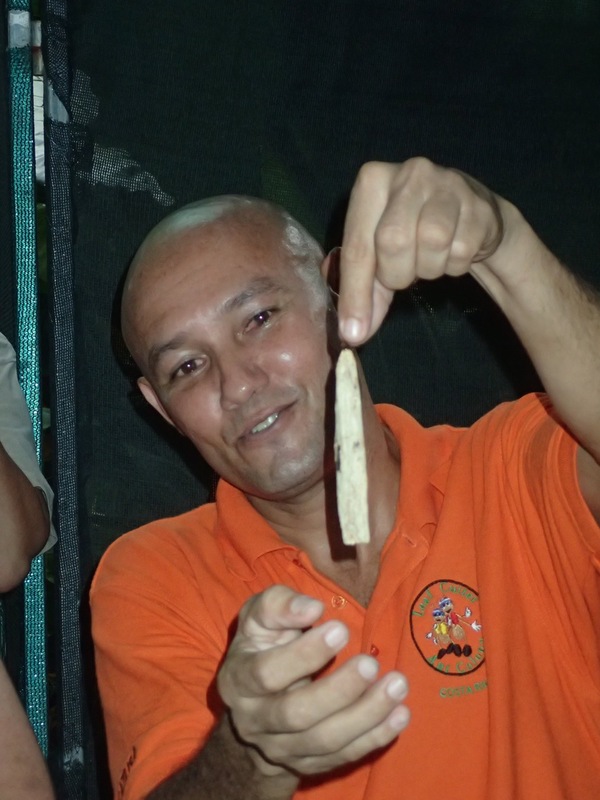 Carlos – our host – has been stung five or six times and agrees that the pain is intense. 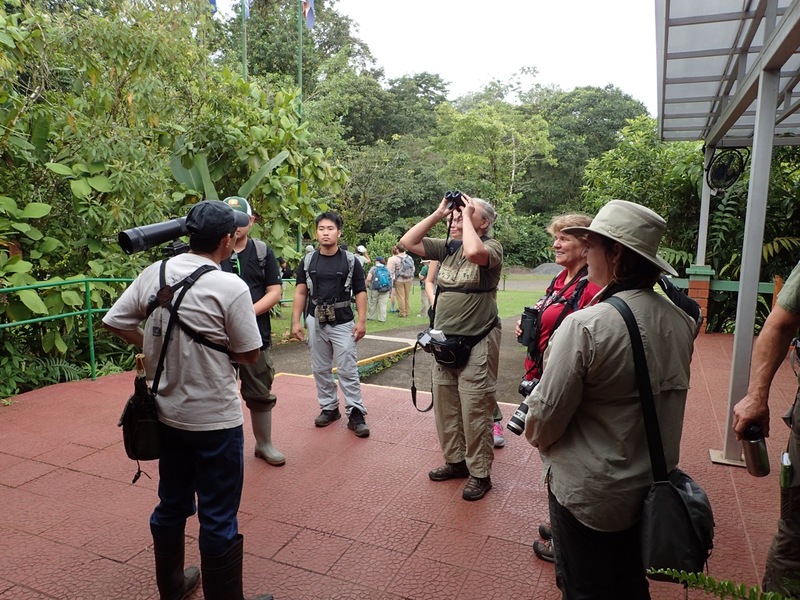 We visited La Selva Biological Station on our second day at Sarapiqui. As a biologist, this feels like my very own pilgrim to a shrine…in this case a biodiversity shrine. This is a very large field station associated with a large expanse of protected forest combining private and public (government park and reserve land) parcels into a nearly contiguous range of forest up and over a mountain. With this much intact habitat, this is literally a researcher’s dream! 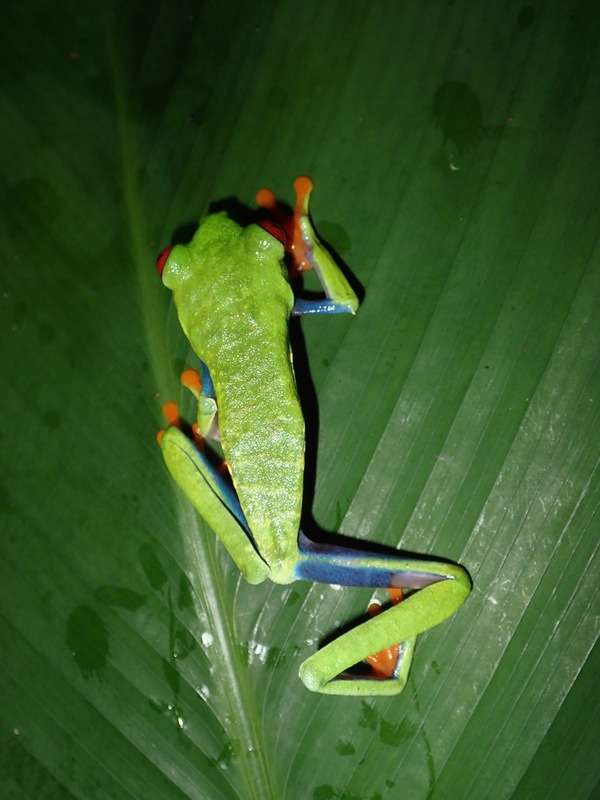 La Selva Biological Station is located along the banks of the Sarapiqui River in Costa Rica. 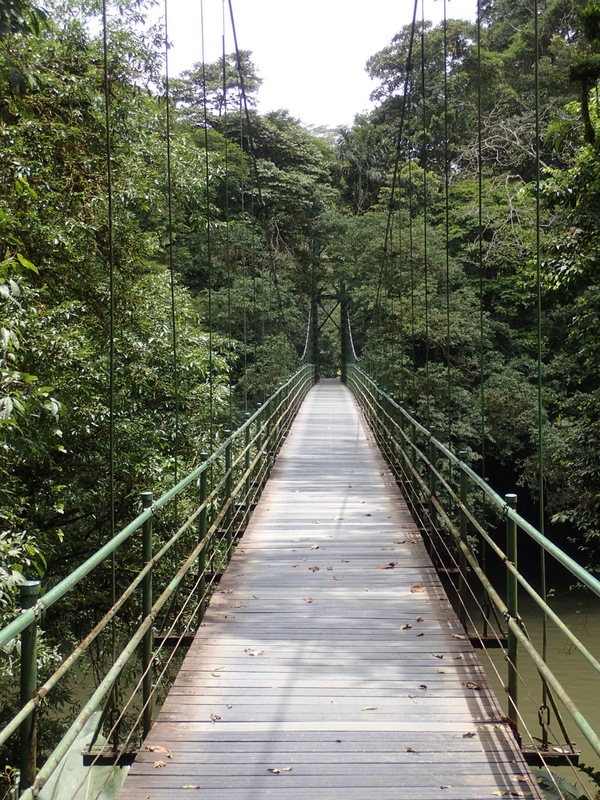 The two sides of the Sarapiqui River are accessed via this hanging bridge. 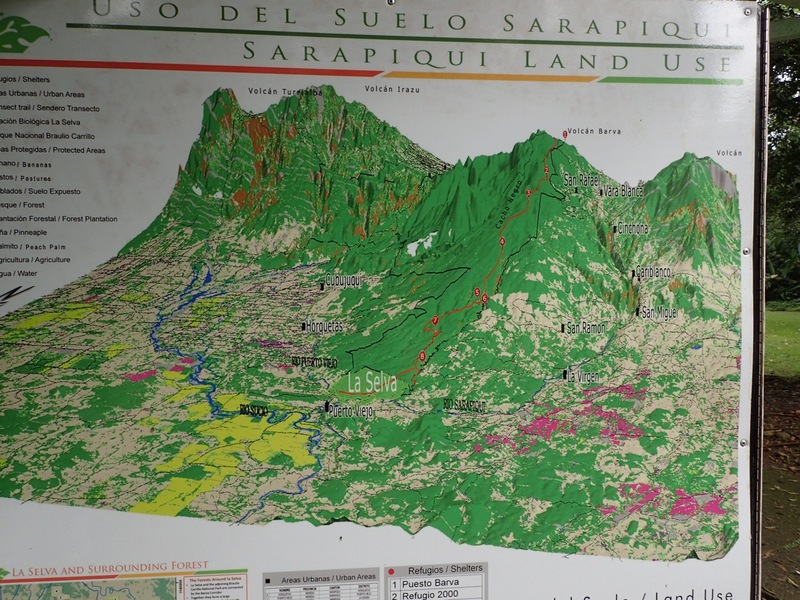 This map shows the area of La Selva and it’s surrounding habitats. 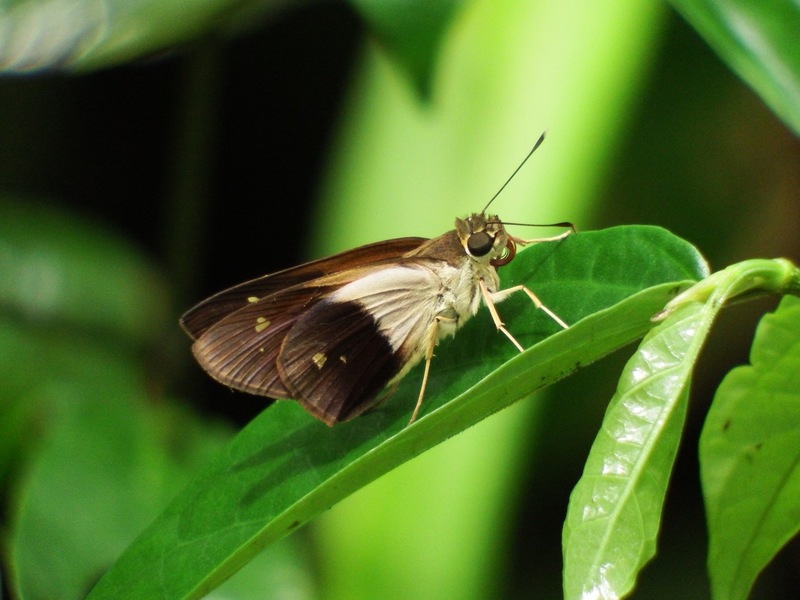 You can definitely see the wide expanse of intact forest lands that comprise both primary and secondary rainforest. We split into two groups for our hike with one group concentrating on birds for the most part and the other group looking for anything of interest and all critters. One of the two groups that went out with the guide. This group focused on birds. 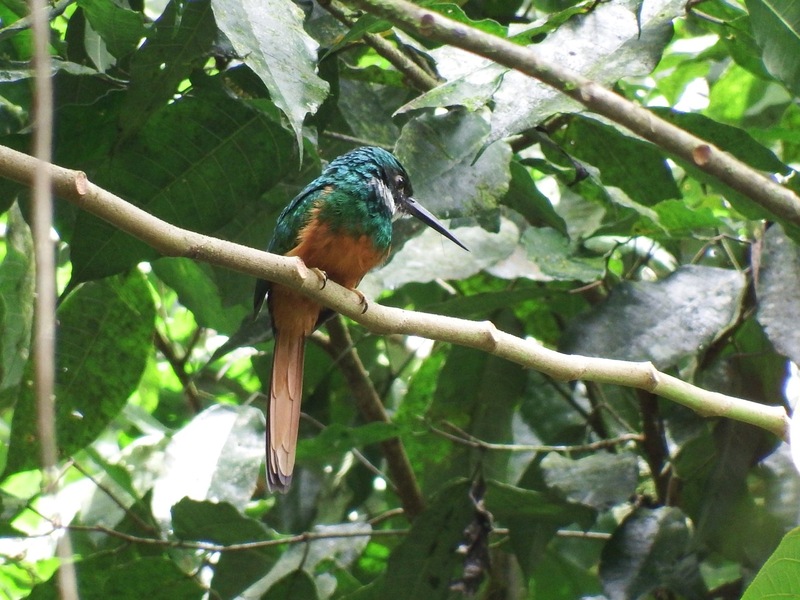 La Selva Biological Station. 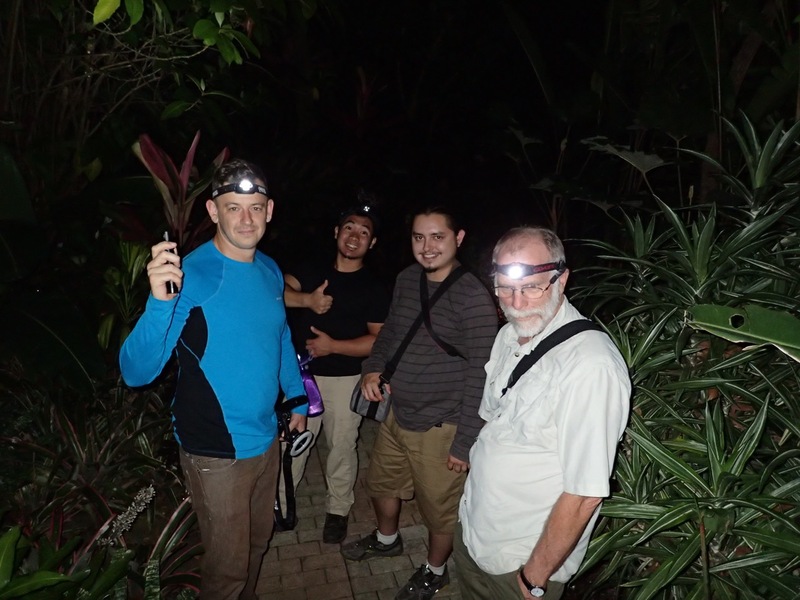 And…we also were able to see a colony of the Honduran White Bat. 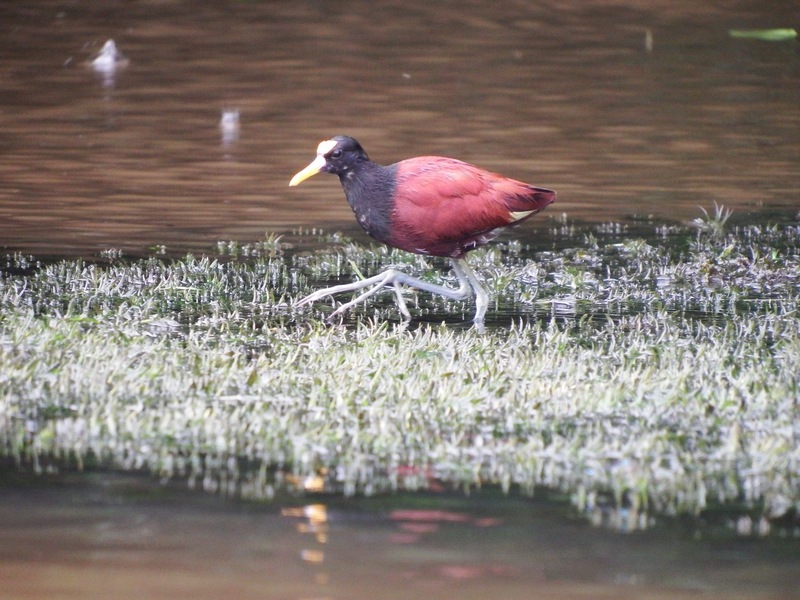 One of my very favorite species! 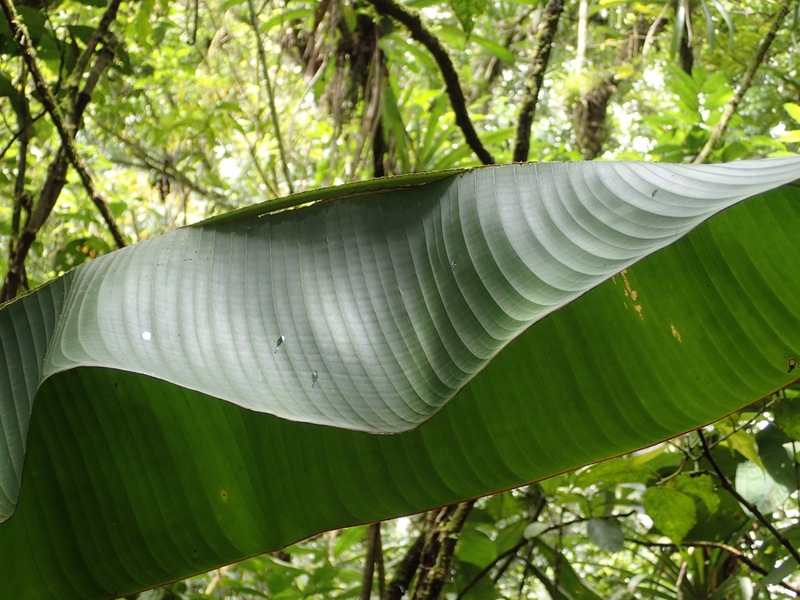 This is a heliconia leaf that has been modified by the bats into a “tent”. The top and sides are pierced (with their teeth) to cause the sides to fold down, leaving one portion intact, thus creating the “tent” for shelter. Another view of the tent from underneath. You can see the colony of bats in the middle of the tent. 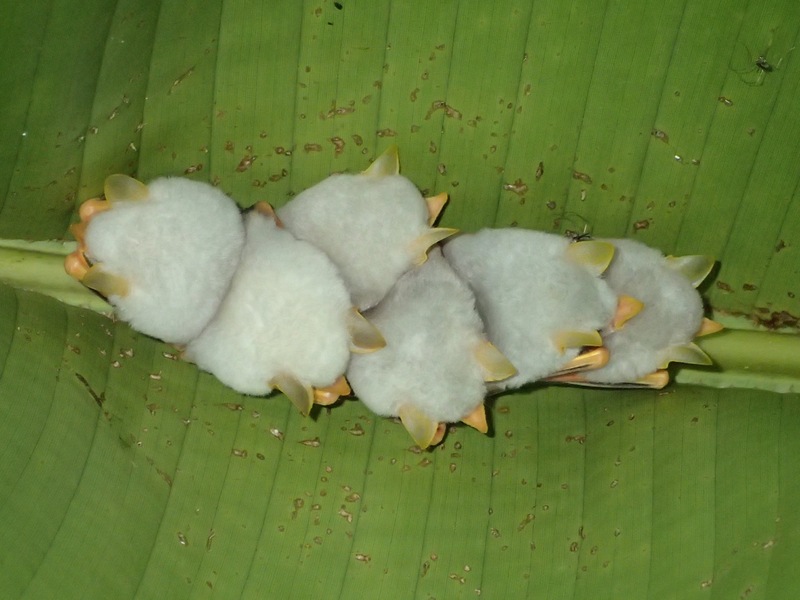 Six Honduran White Bats (Ectophylla alba). 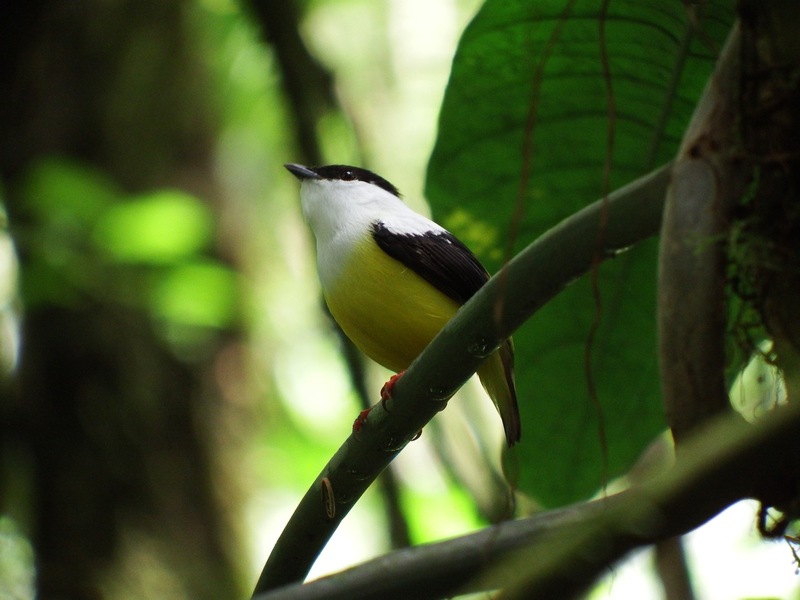 La Selva Biological Station, Sarapiqui, Costa Rica. 26 July 2015. 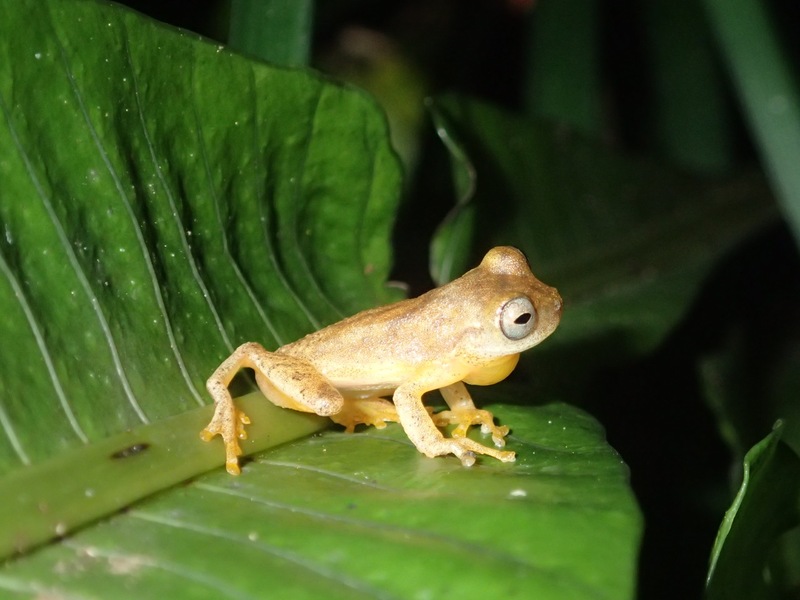 After a great morning of wildlife at La Selva, we went into Sarapiqui and had lunch, then headed back to La Quinta. A group of six people went out that afternoon white-water rafting for a couple of hours and the rest of us stayed back at the La Quinta. 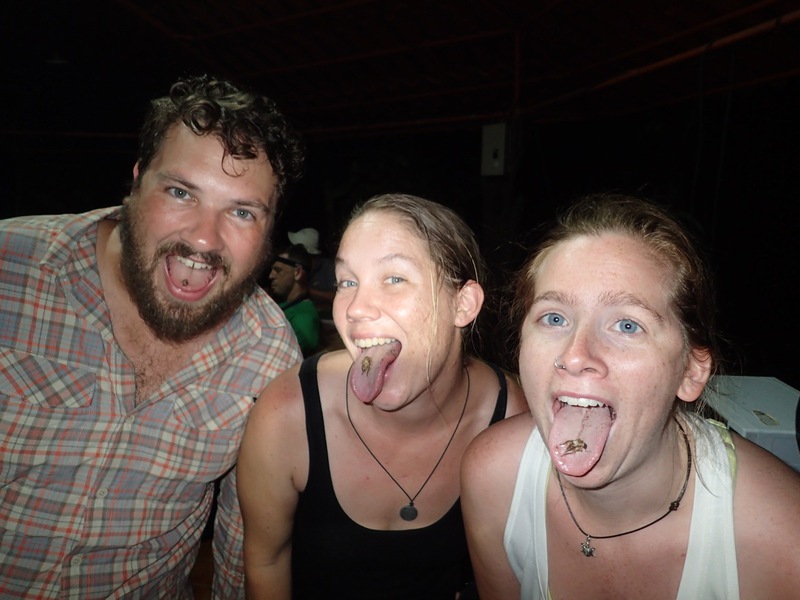 In the evening we went to a place that raises invertebrates…like large beetles and large spiders – among other things. 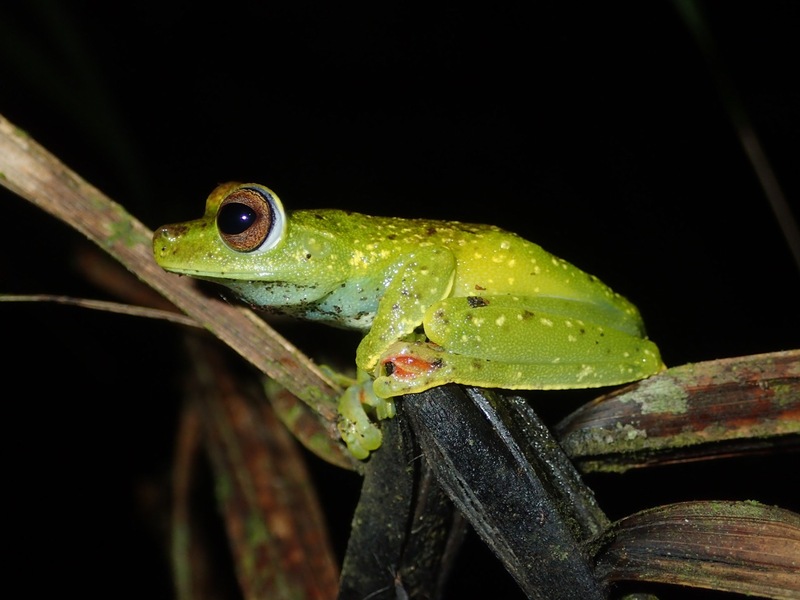 They also built a large number of small ponds which ended up providing habitat for many frogs and other creatures (as intended). 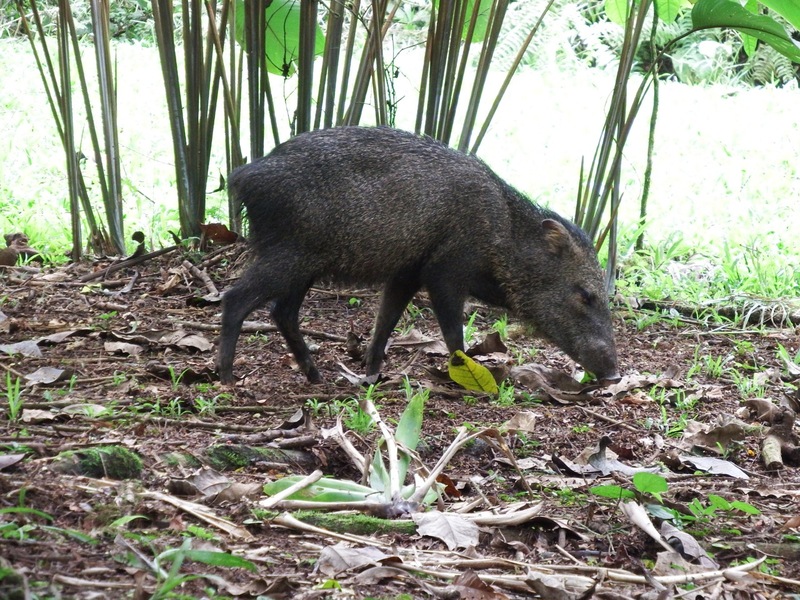 In Costa Rica, you can restore habitat but you cannot transplant animals into that habitat…sort of Field of Dreams kind of deal where “if you build it they will come”. 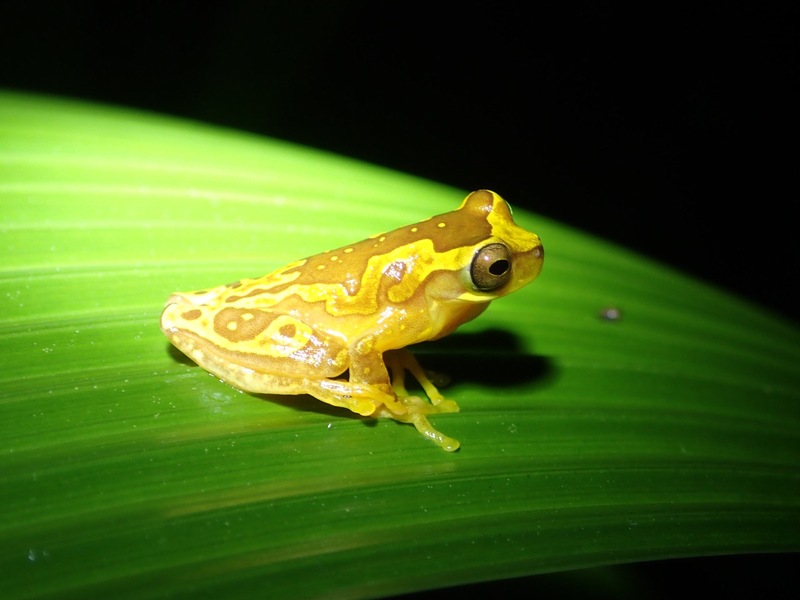 An Hourglass Frog at one of the constructed ponds. 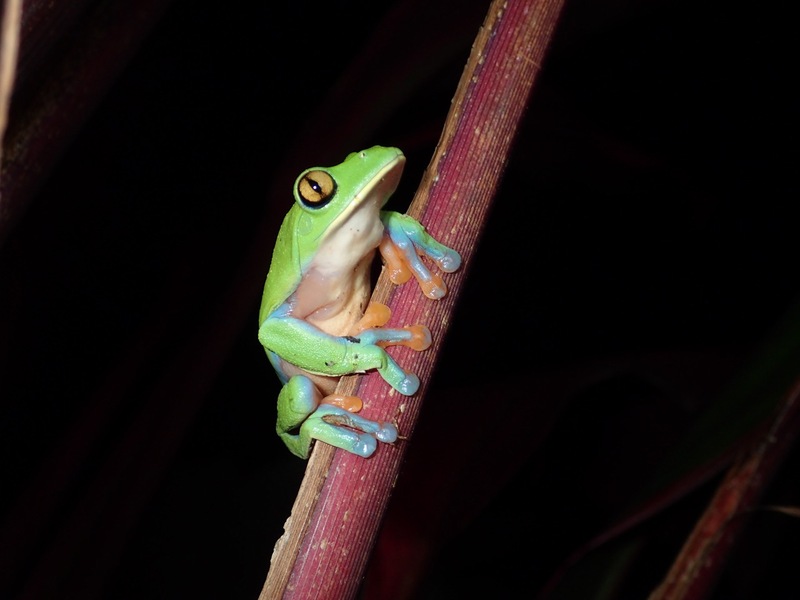 Other frogs seen at these ponds included the Dink Frog and the Red-eyed Treefrog. 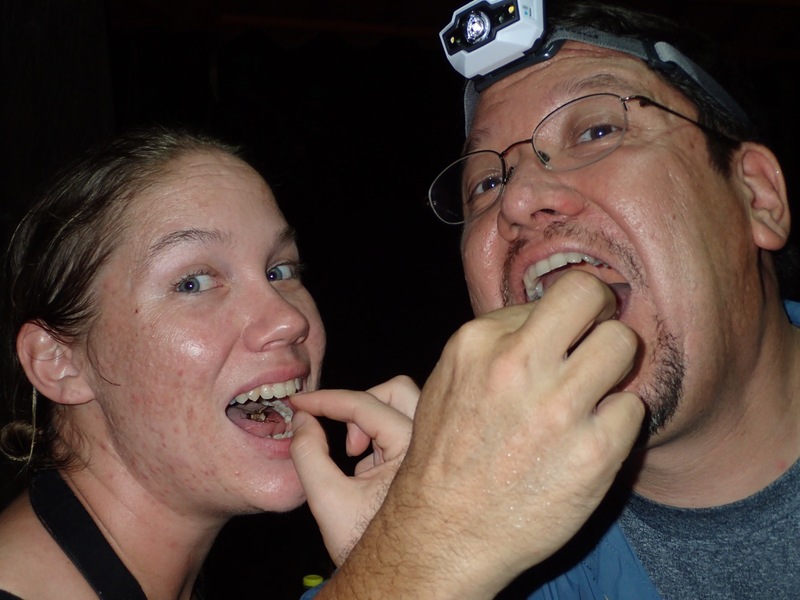 Sampling some cuisine…this time roasted crickets. Tasted like a mix of shellfish and popcorn…including the crunch. 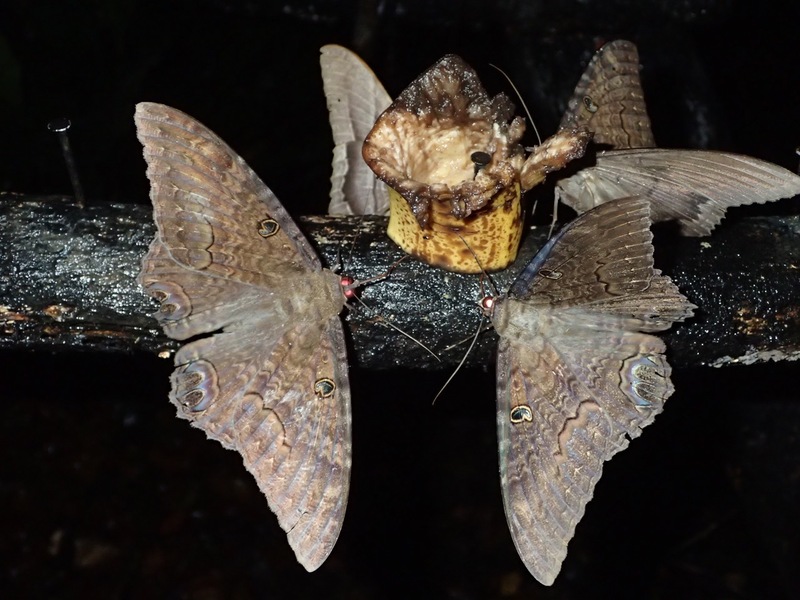 Black Witch moths were attracted to the fermenting fruit on the bird fruit stand. 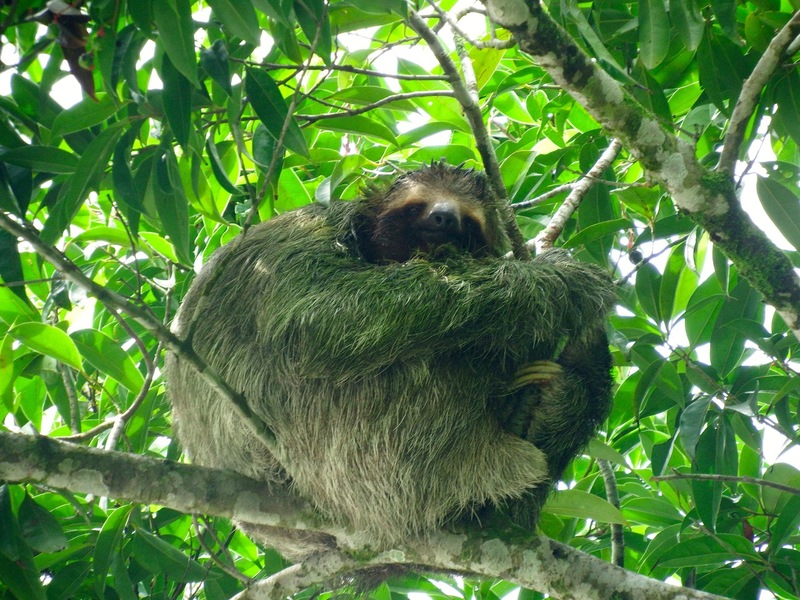 These are a large species sometimes reaching a width as large as six-inches. 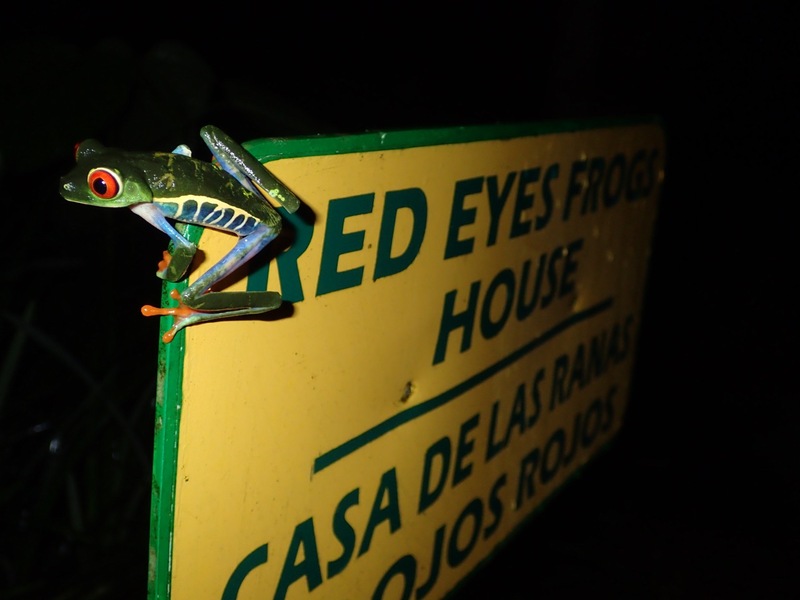 Loved the sign, but loved the fact that a female Red-eyed Treefrog was perched on the corner of it…and no, this truly was not staged! MORE TO COME! All photos by David Wyatt unless otherwise noted. This entry was posted in Uncategorized on July 25, 2015 by bassariscusastutus. 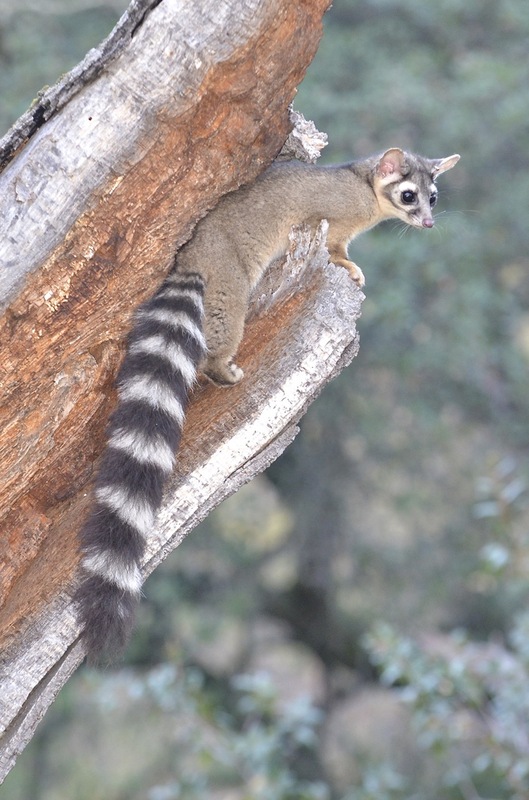 Ringtail photographed in the Sutter Buttes, California. 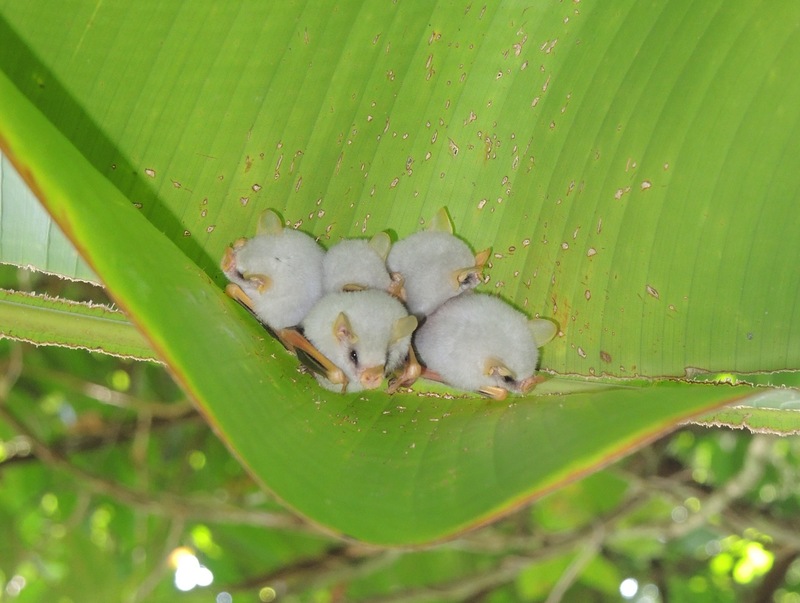 Honduran White Bat (Ectophylla alba) at Sarapiqui, Costa Rica. 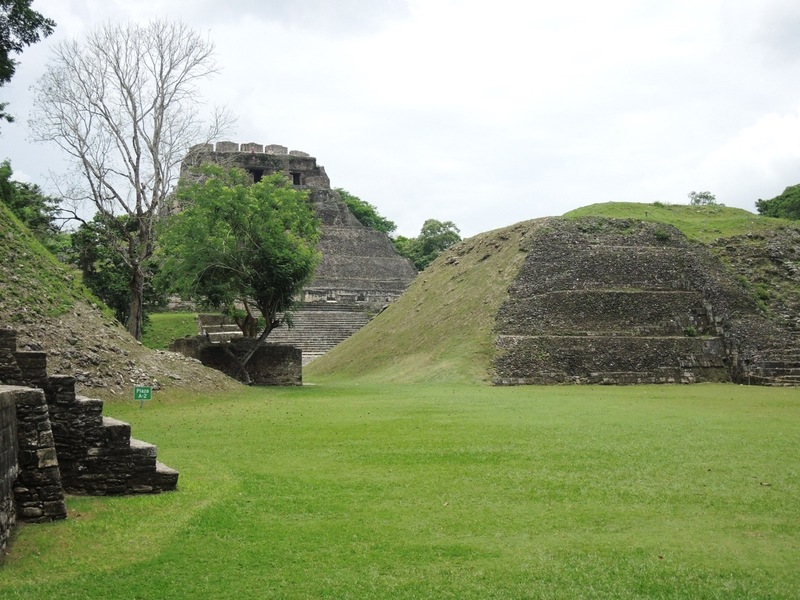 Xunantunich – Near San Ignacio, Belize. 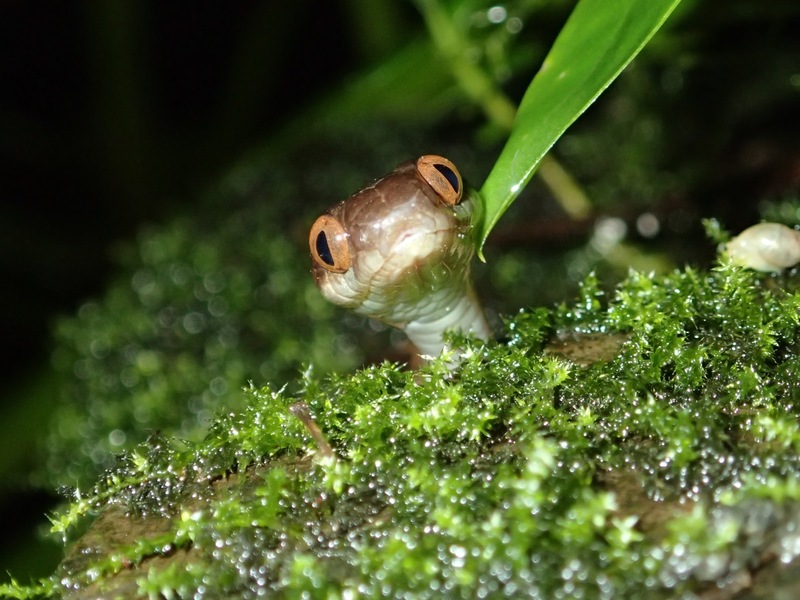 This entry was posted in Uncategorized on August 30, 2012 by bassariscusastutus.